I really wish I could remember the exact moment that I decided my goal in life would be to visit all 193 countries. Wouldn’t it be cool if there was some specific and defining event that acted as a calling for me to take on this challenge that very few in the world have ever accomplished? But the truth is, I have no clue when this crazy idea of seeing every nation on earth was conceived, just the memory of a few integral levels of “travel passion” throughout various stages of my life. The first was an obsession for Brasil: an infatuation so strong, that I would dream of Brasil before even setting foot in the country. By the time I was 30, I’d quit my job and say goodbye to my family and friends and sell my car, all to start a new life in the northeastern city of Recife. Brasil had captured my heart in every way, and I surrendered. My first trip to Brasil, 2001. I’d traveled to Europe, Tahiti and Belize with my Mom; and while I thoroughly enjoyed those trips, my travel addiction hadn’t yet blossomed. This is evident in my photo collection from these trips. For example, I think I have just one, single photo from my trip to Belize. How lame is that??? A far cry from the hundreds of photos and videos and elaborate blogs I create today. And I remember not liking Rome at all; way too many tourists. On a solo trip to Venice, I actually called the airline to see if I could come home early. I was bored. 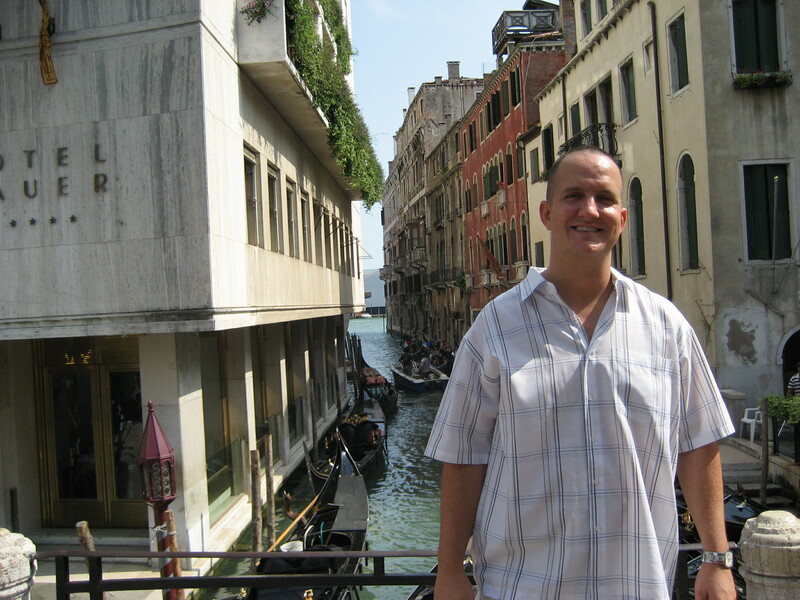 Venice, 2008. I wanted to go home. But one day, my mind began to transform. I’d always been in love with South America and all things Latin. 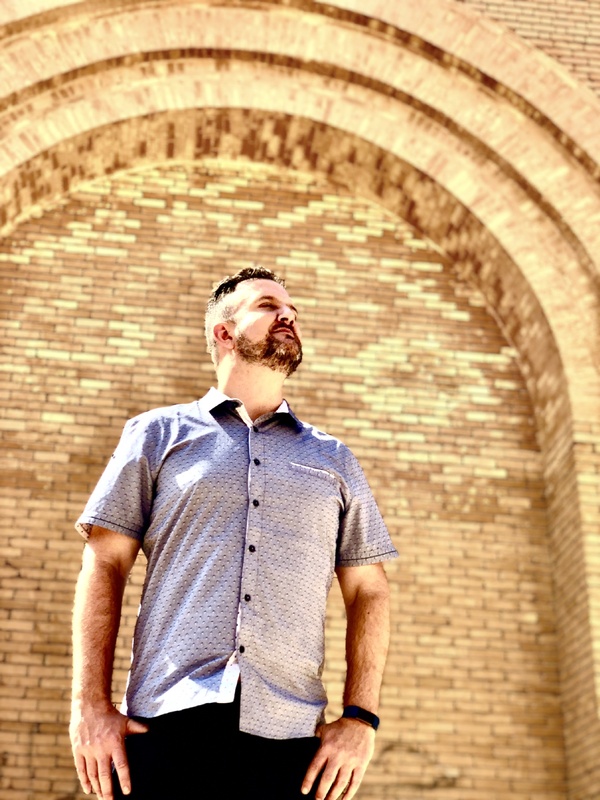 I grew up in L.A., Orlando and Tucson, Arizona and always had a thing for Latinas, Mexican food and Latin music—so it was no surprise that my first experience “counting countries” would be to conquer all of Central and South America. Maybe “conquer” isn’t very politically correct, but you get what I’m saying. I wanted to see every nation in the Americas by 40. I absolutely loved Argentina. Uruguay charmed the socks off of me. I began to become intrigued with the differences between these South American counties; some subtle, some major. But I think what really got me interested in seeing every country in the world, was seeing the Guyanas. When I ask people if they can tell me where the country of Suriname is located, most have no idea. 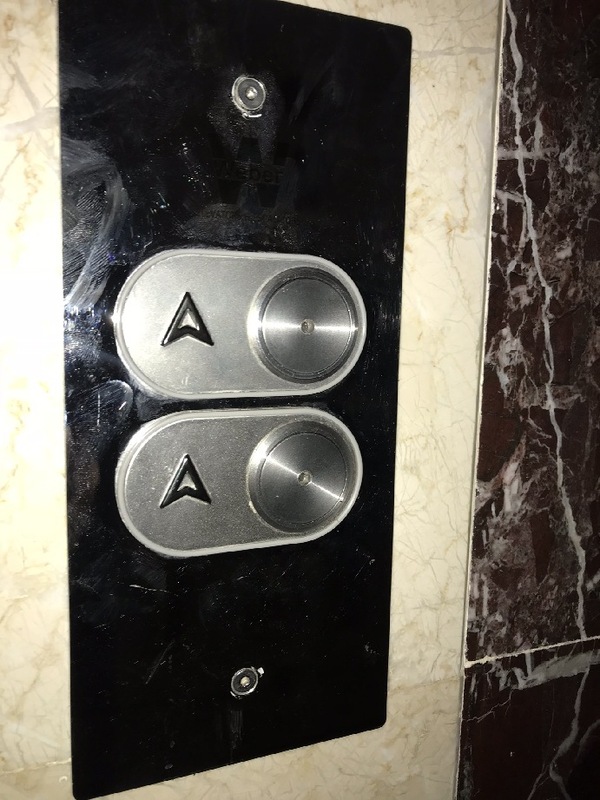 Others guess somewhere in Asia or Africa. But that fact that Suriname is actually located in South America—and to make it even weirder—they speak Dutch; well that sounds just downright absurd, right? For there to be a nation in South America that doesn’t speak a lick of Spanish, and whose demographics include folks with Indian and Chinese backgrounds and a special group of Africans labeled “Maroons”…that speak Dutch…well that just blew my mind. I just had to learn how this bizarre land that follows no South American stereotype came about. 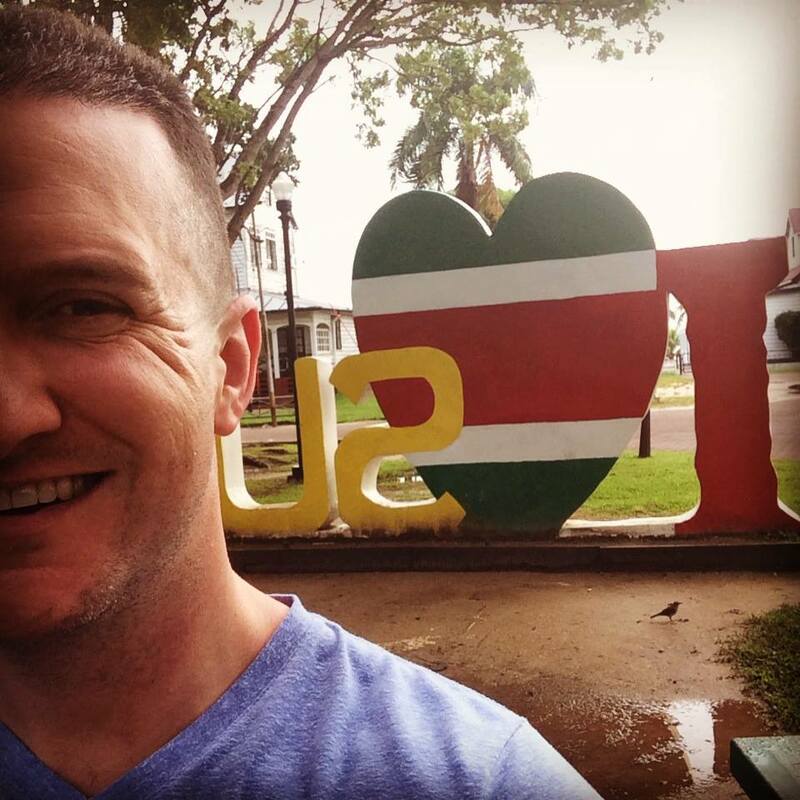 So Suriname was the first country that I actually “studied” intently before visiting, and to this date, still one of the most bizarre places I’ve seen. 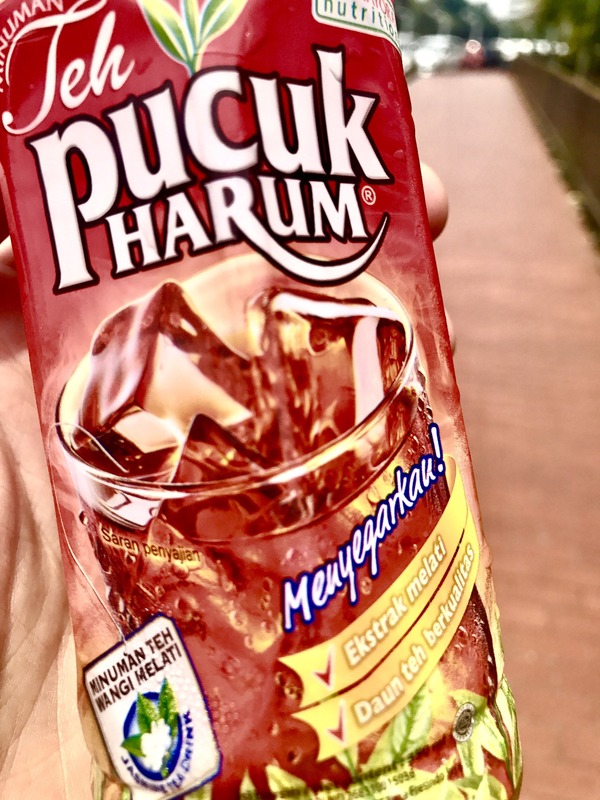 But I like bizarre, and I feel it was probably the “bizarreness” of Suriname that fueled my appetite to see every single nation on earth. 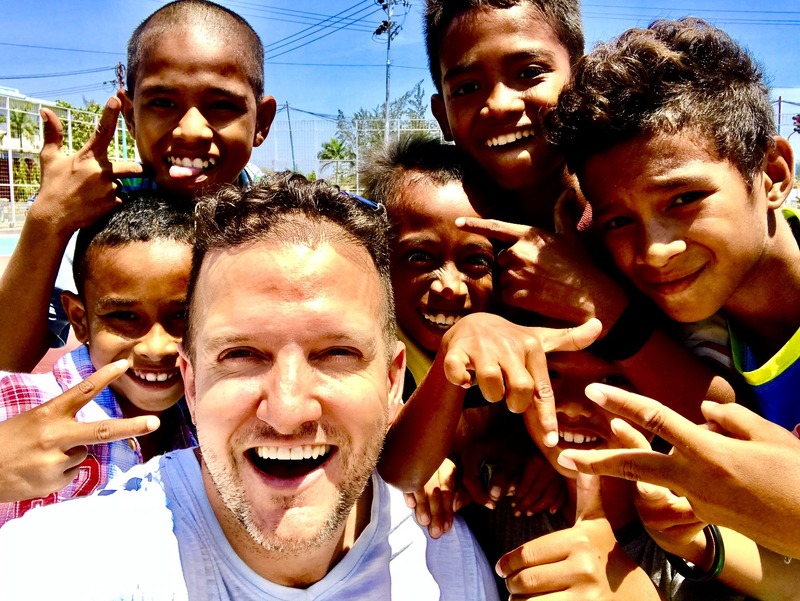 While places like Rome and London did little for me, it was the randomness of places like Mauritania, Nauru, and Timor Leste that really made me happy. These are sovereign nations that my friends had never even heard of—nor I—until I began this adventure to see all 193 countries. The mere fact that most people don’t even know that these entire nations exist turns me on. So why did I choose Iraq for country 100? 100 had to special. I wanted to go somewhere that tourists don’t go. Somewhere you’re not supposed to go. Somewhere whose name alone makes you go “wow.” I’d already checked North Korea off the list (country #52). Iraq just seemed to be a no-brainer for lucky #100. I couldn’t think of any place more extreme. But what about safety? I think that’s the biggest challenge in seeing all 193. It’s just impossible to visit every country in the world by skipping the sketchy ones. 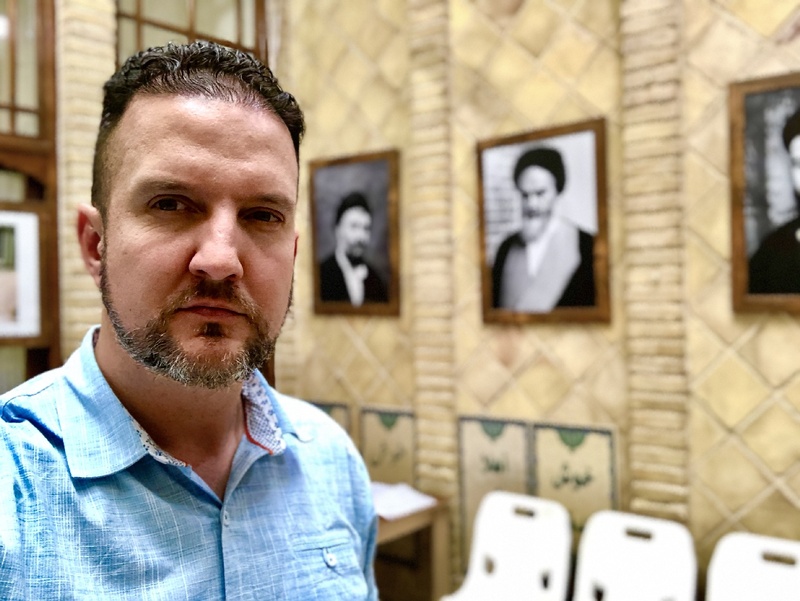 Luckily, I was already primed; having visited numerous countries on the State Department’s “Do Not Travel” list, including Venezuela, Libya and Iran. Plus, I’d planned to visit Iraqi Kurdistan, a tourist-friendly and quasi-independent territory in the north of Iraq. This region is actually pretty chill at the moment, and very welcoming to tourists. 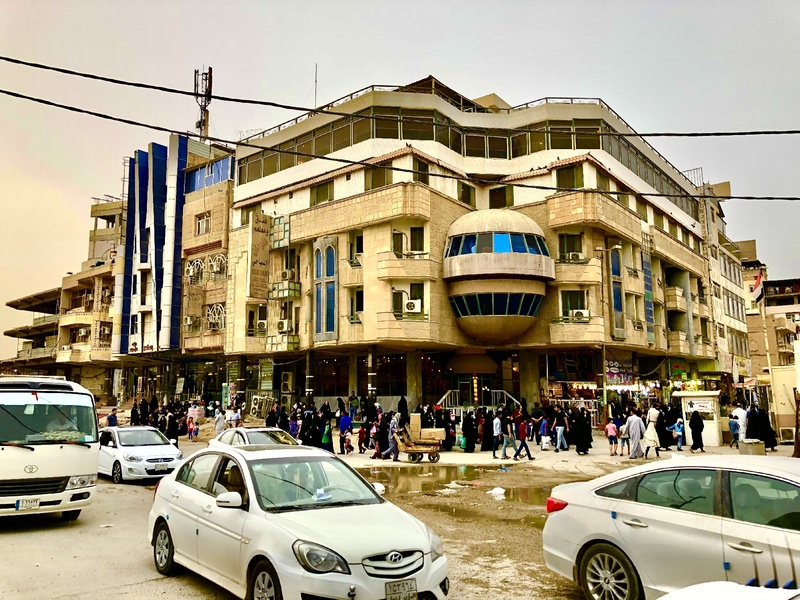 Kurdistan offers visitors a visa on arrival and there is a plethora of tour companies offering their services in Kurdistan. A handful of fellow travelerS I know have recently been there. 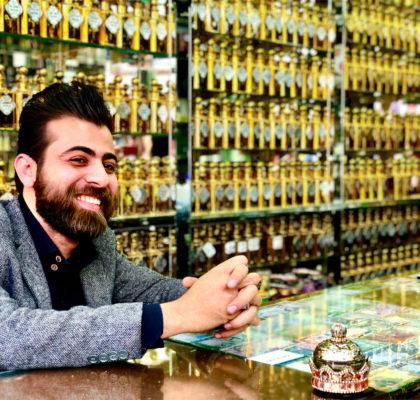 So as crazy as “visiting Iraq” sounds—traveling to Kurdistan actually isn’t too wild. 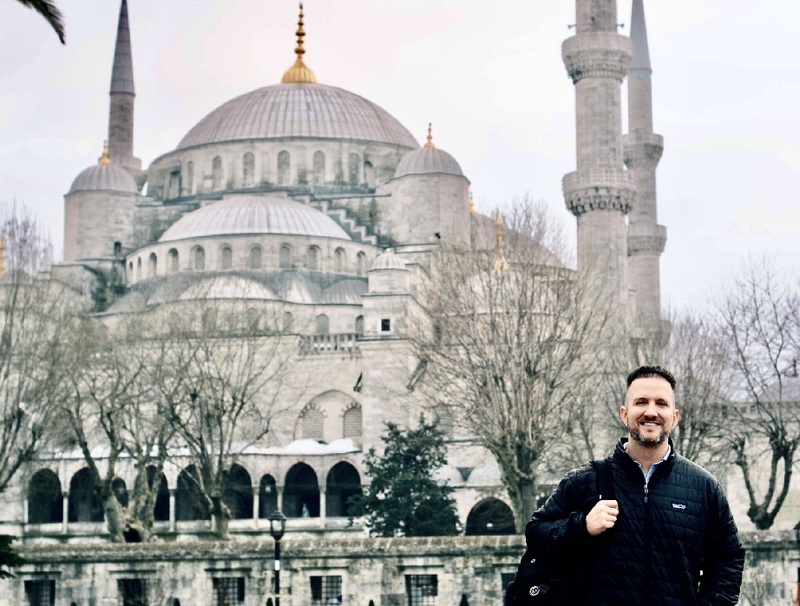 I’d contacted a tour guide there, booked my air travel in and out of the region (into Georgia, flying back home from Jordan), and I was ready to go! I’d see Turkey, Georgia, Azerbaijan and Iran, before hitting the big #100, Iraqi Kurdistan. 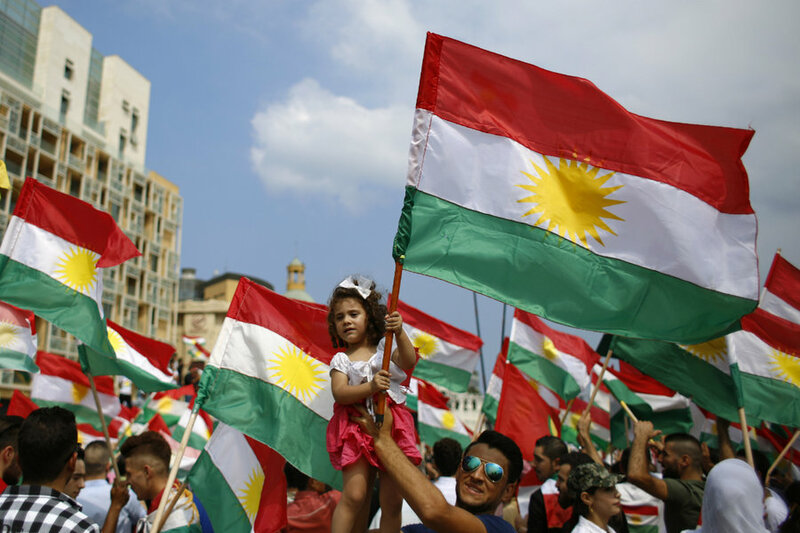 Until Kurdistan voted for independence. That changed everything. 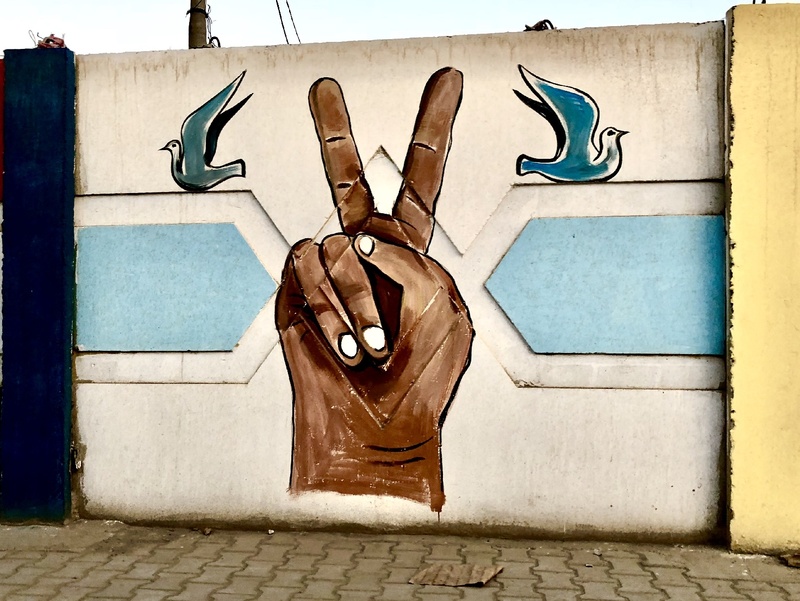 In September of 2017 (just a few months before my big trip), the Kurds voted to separate from Iraq, and won the vote. 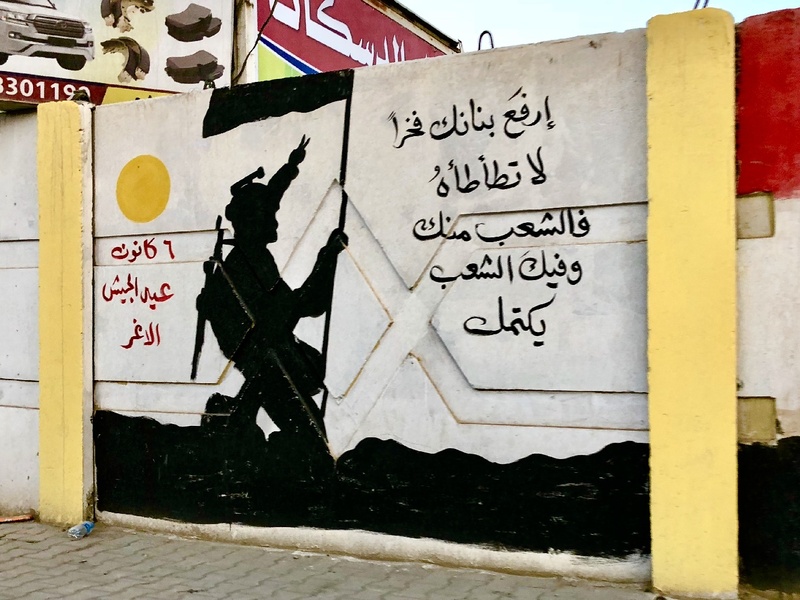 This did not go over well with Baghdad: not only did the Iraqi government not acknowledge the referendum, but as punishment, Iraq closed the Kurdistan airport by cutting off the surrounding airspace. My plans were done. There was now no way in. And there’s no way I could (or should) get into Iraq proper. Yeah, like I was going to let a little setback stop me. 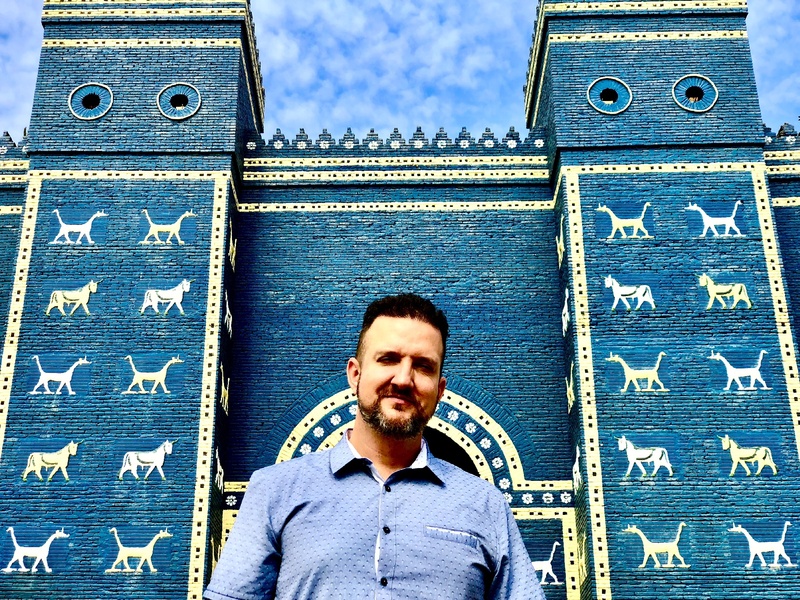 I was absolutely determined to make Iraq my 100th country. 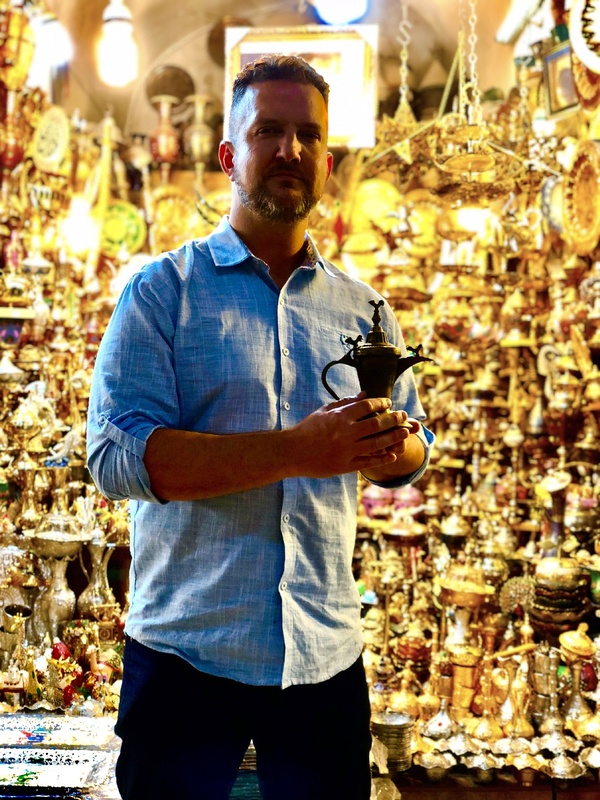 My airfare into the Middle East was already bought and paid for, and I didn’t have time to pivot. 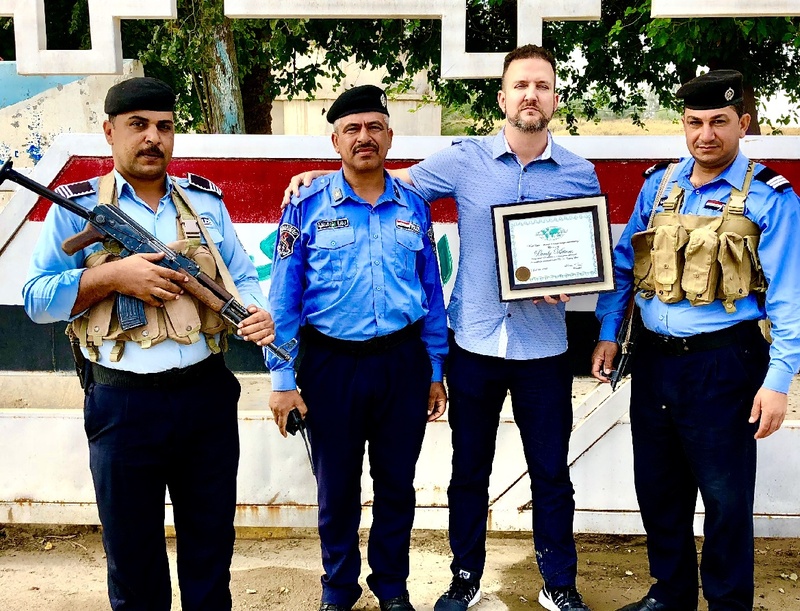 I wasn’t going to let a tranquil and easy-going nation like Jordan be my #100…I had to get to Iraq. Thanks to some fellow travel experts (actually, people much more well-traveled than me), I was able to score a contact to a travel agency who could get me in. It wouldn’t be easy. And it certainly wouldn’t be cheap, but it would be my calling. Here’s the part where I like to “shake my head” at my own self. I think it’s crazy that 99.99999999999% of Americans wouldn’t travel to Iraq if they won a first class, all expenses paid trip there! And then there’s me (and a few others), who actually work their butts off to get through multiple barriers, and spend a lot of money, time and effort, just to get in somewhere that no one else wants to go! I know, I know: I’m the weird one. It began with my tour guide and his team applying for me in Iraq. They’d present my documents to Iraq’s Department of Foreign Ministry in Baghdad for processing. This takes a while. In my case, the Iraqis made an error and approved my visa as a “religious” visit. My documents then had to be submitted all over again, and that just added another two weeks to be approved that second time. By now, time was running out, and it was getting dangerously close to my departure. 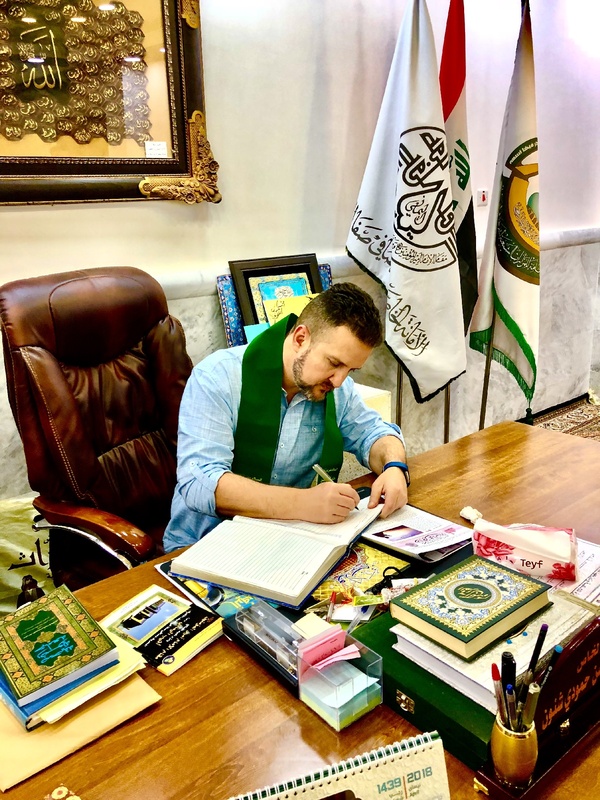 Finally, I had received the proper authorization letters from Baghdad, which I would have to take personally, to the Iraqi Embassy in Los Angeles, to receive my physical visa. This was an event in itself. I made the two and half hour drive from San Diego to Los Angeles, to stay the night and get up early the next day. I arrived at the embassy on Wilshire Boulevard early Monday morning, 45 minutes before the doors would open. There was already one person waiting. His name was Mohammed (go figure! ), and he’d made the drive non-stop from Salt Lake City, Utah. 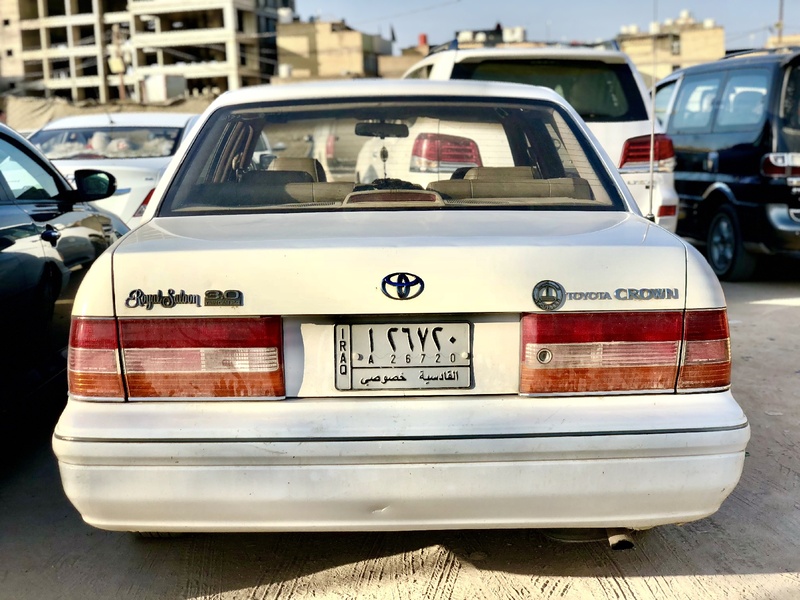 He was an Iraqi national and needed to check in with the embassy to “prove he’s still alive,” as he owns property in Iraq and wanted to keep it. Mohammed was super nice, and we chatted almost the entire time. We were soon joined by another Iraqi man, who joined in the conversation. They both were surprised, but thought it was awesome that I would be visiting Iraq, and immediately began offering me tips and advice. They told me I was going to love it. By 8:45AM, there were over a dozen people waiting for the embassy to open, from elders to babies. When the doors finally opened at nine, Mohammed insisted I enter first. I reminded him that he had been there first, but he insisted that I was “their guest,” and wouldn’t let me say no. 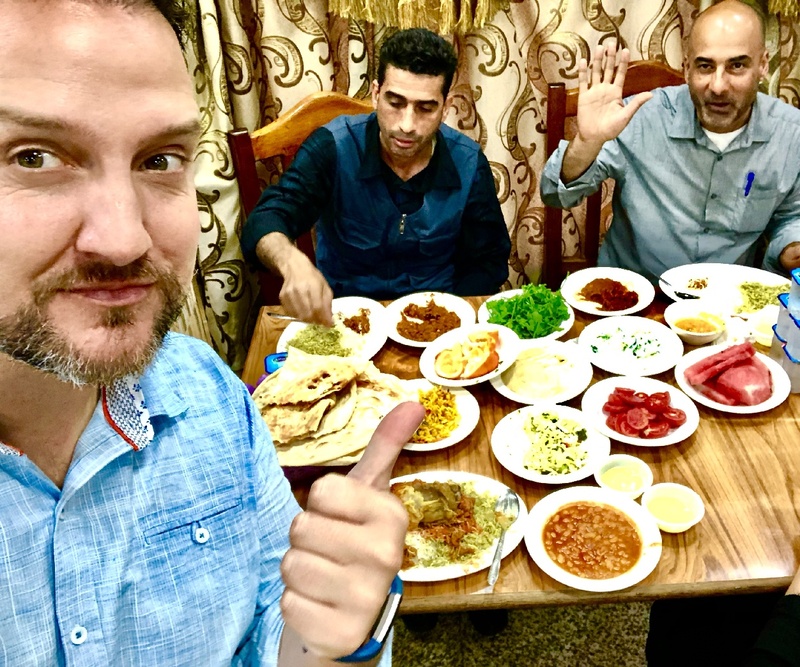 I hadn’t even left the country yet, and was already experiencing Iraqi hospitality. I was very stressed out. I’d leave in just nine days, and I wasn’t sure the embassy would issue my visa in time. Their website said it would take 15 days, and this had me dreadfully worried. Before driving to see them, I’d called them for days, but no one ever picked up. I finally called their embassy in Washington, and the lady there told me it’d be at least ten days, too. But I didn’t have ten days. I was so stressed out that this trip would be over before it even started. It was down to the wire and I needed that visa. I handed over my documents inside at the counter, and let out the biggest sigh of relief when the man in the suit told me my visa would be ready at 2PM. Hallelujah! That afternoon I drove back to San Diego, the proud owner of a passport that included an Iraqi visa. I was going to Iraq! 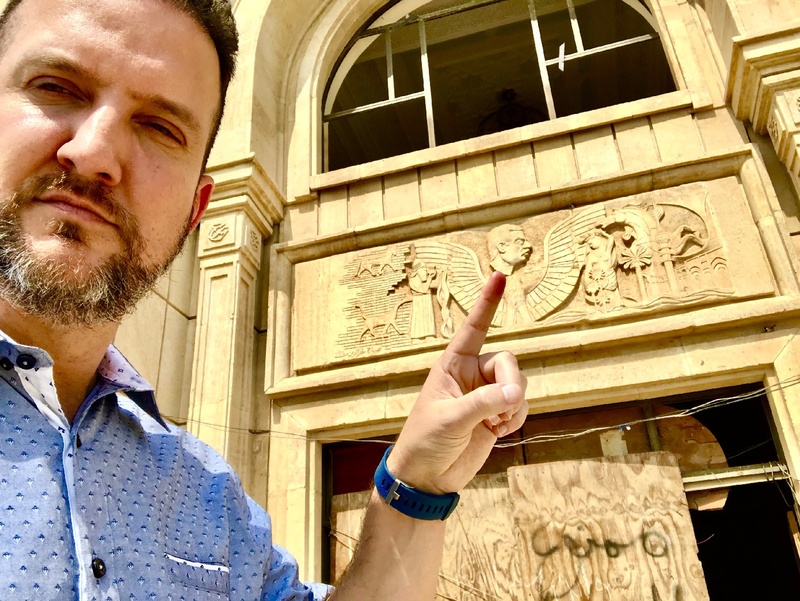 The Iraqi Consulate in Los Angeles. I left of March 28th with all the excitement of a child on his way to Disneyland for the first time. I’d been stateside for over three months, and I needed my fix. Travel seemed like a drug, with the worst addiction. And the more I “used,” the more I needed. I was literally going nuts waiting for this trip…having some serious withdrawals. The route was San Diego to San Francisco to Turkey, for a layover long enough to leave the airport and head into town for dinner. Then it was on to Georgia, Azerbaijan, Armenia and Iran (those stories to be posted soon), and finally, off to Iraq. 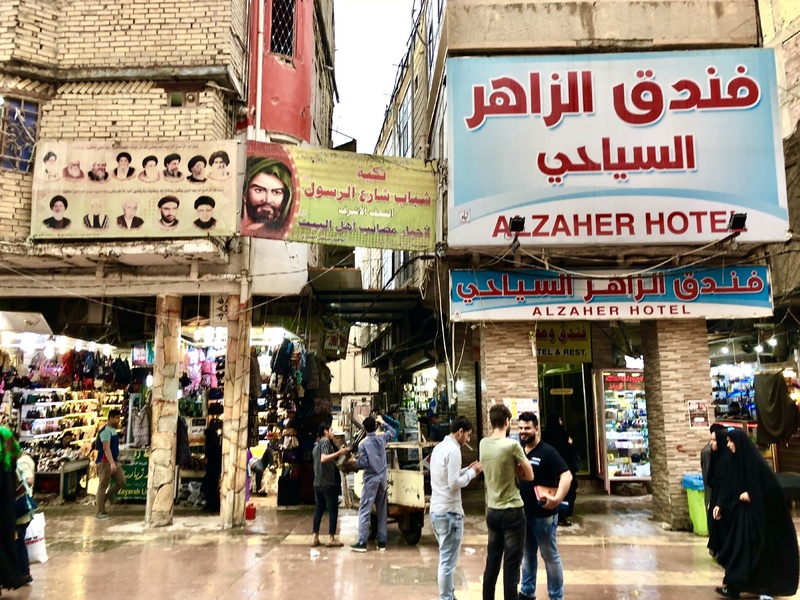 The stops leading up to Iraq were wonderful, but pretty “normal.” I saw touristy things and did touristy stuff with touristy people. But now, it was time to do some 007 stuff…to out-Bourdain Anthony Bourdain. Hold my calls Marge, I’m going to Iraq. Since Kurdistan had been ruled out due to the recent airport closure, I was given the options of choosing either the cities of Baghdad, Basra or Najaf. 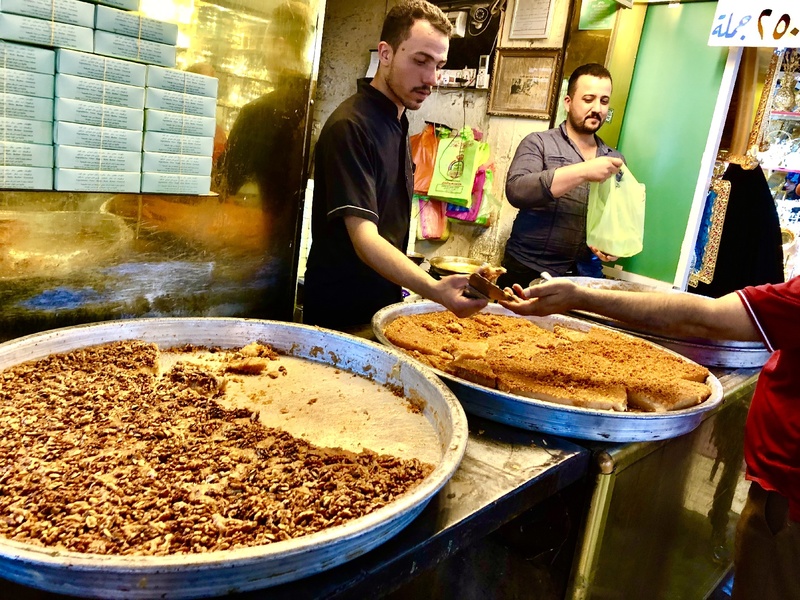 Though the thought of visiting Baghdad allured me, after some research and recommendations, Al Najaf was the clear winner. 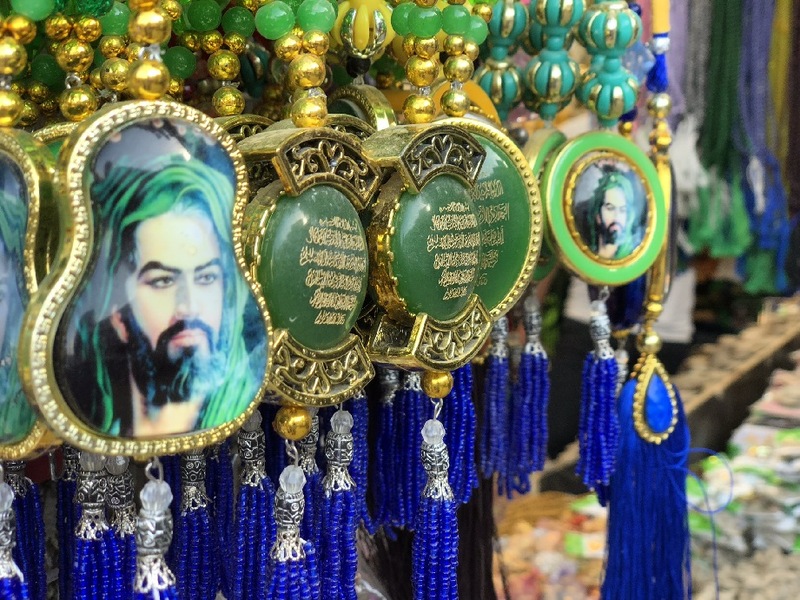 It’s the world’s fourth holiest city, right after Mecca, Medina and Jerusalem. My flight from Dubai to Najaf on flydubai was uneventful, but I must admit, I did enjoy watching various folks get kicked out of the premium seats on the plane. No shame people, no shame. Truth be told, if this was my first time entering a “risky” country, I would’ve been so nervous arriving…but it wasn’t my first rodeo. 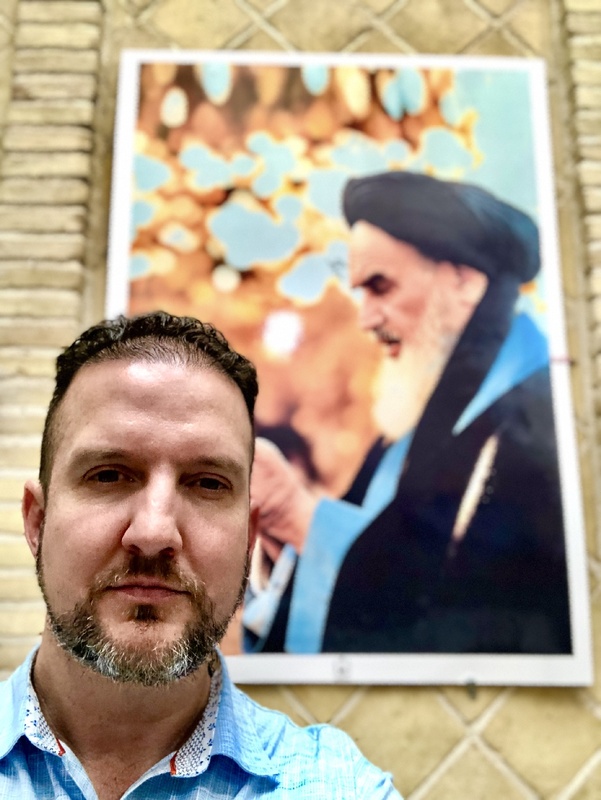 I’ve braved so many volatile places recently, and thanks to the great info and preparation provided by my highly-recommended tour guide, I wasn’t stressin’ too bad about Iraq. Okay, maybe a little. There did seem to be a minor paperwork mishap when I presented my docs to immigration upon arrival, but my tour guide had people on the inside–people working at the airport that were expecting me. I took a seat while everything was worked out. 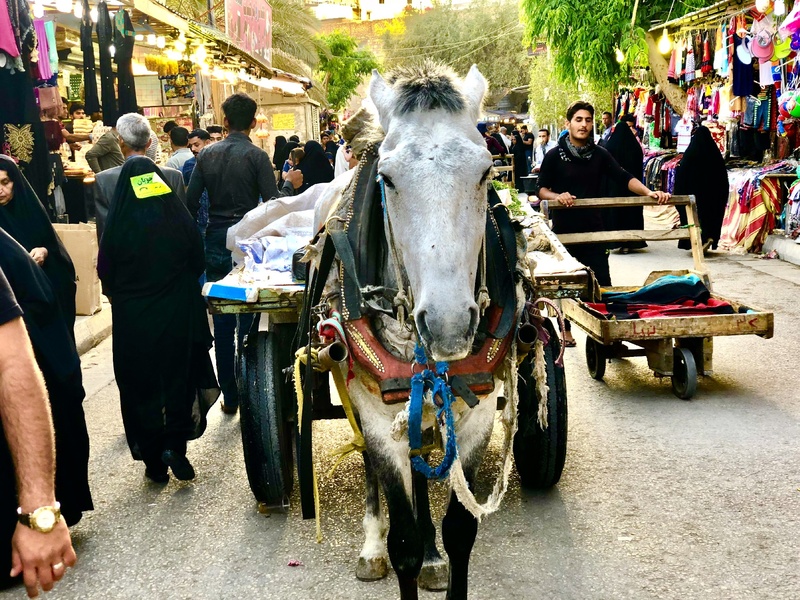 I later found out that there had been a small error on my visa, and the immigration officers and my guide actually had to call Baghdad to get it sorted; but they did, and minutes later I was in the car, riding through the streets of Najaf, Iraq…it was glorious! 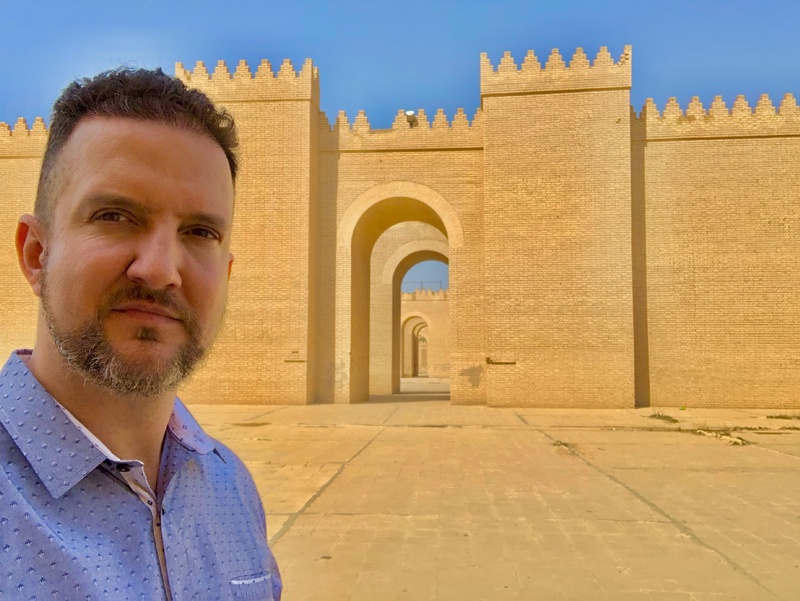 I was really in Iraq…so much emotion! I didn’t know if I was excited, relieved, scared, or exhausted! 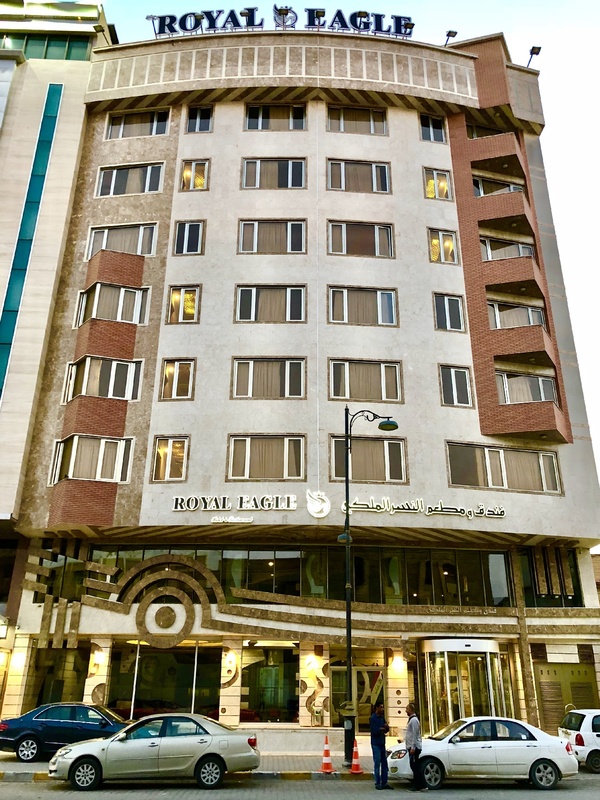 We were soon at my hotel: The Royal Eagle; but just long enough to drop my bags and check in with family on WiFi. It was going to be a full day in Iraq! The lobby of the Royal Eagle. My tour guide was Adam, an Iraqi expat now living in the UK. I did a ton of research on this guy, and fellow travelers gave him glowing recommendations. Over the next 48 hours I’d come to know Adam and his family very well, and he would exceed my expectations in every way. You hire a guy like Adam for many reasons: 1) First, to get your visa. 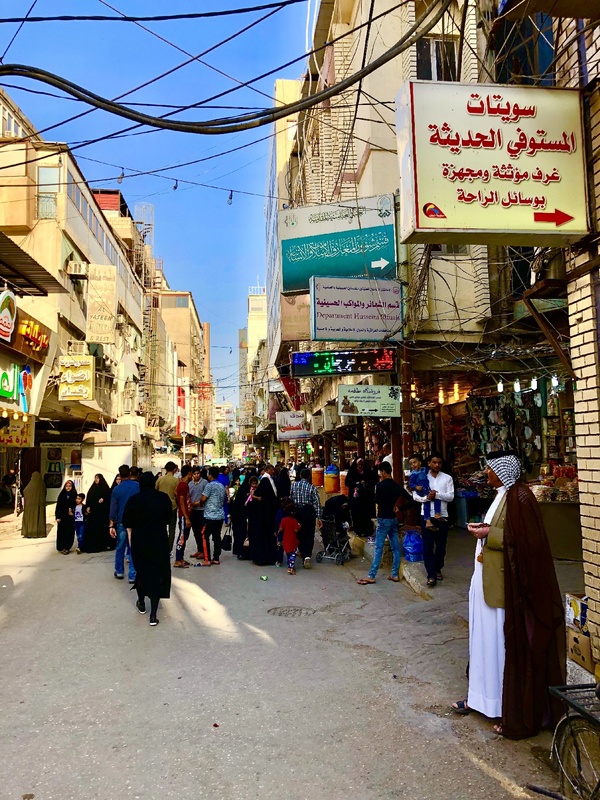 Iraqi visas are extremely difficult to obtain in the first place and you need experts on the ground to do the complicated footwork and follow up. 2) For his knowledge on the country’s history, places to see, and food to eat. 3) For safety. Adam’s primary responsibility is to keep his guests safe. This doesn’t just mean minute-by-minute, while walking the streets–but also the big picture stuff: knowing where to stay, where to go (and not go), and how to get there. And finally, and most importantly, 4) Having all the right contacts. 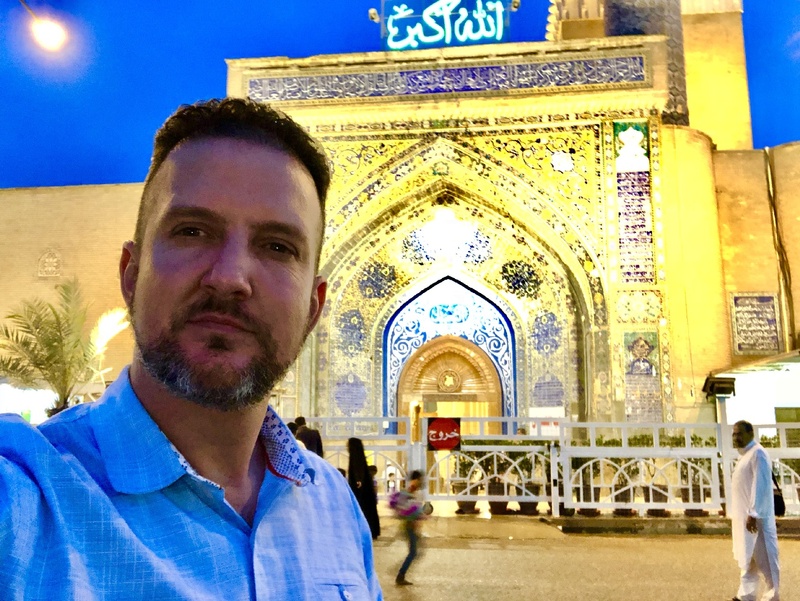 Najaf was the city where Adam grew up. He still has family there, and is as connected as one could be. From airport staff, to city officials, hotel owners, police and mosque leaders, Adam had the keys to the city. I’d made the right choice. And although this tour would be one of the most expensive I’d ever taken, my safety is worth every penny. 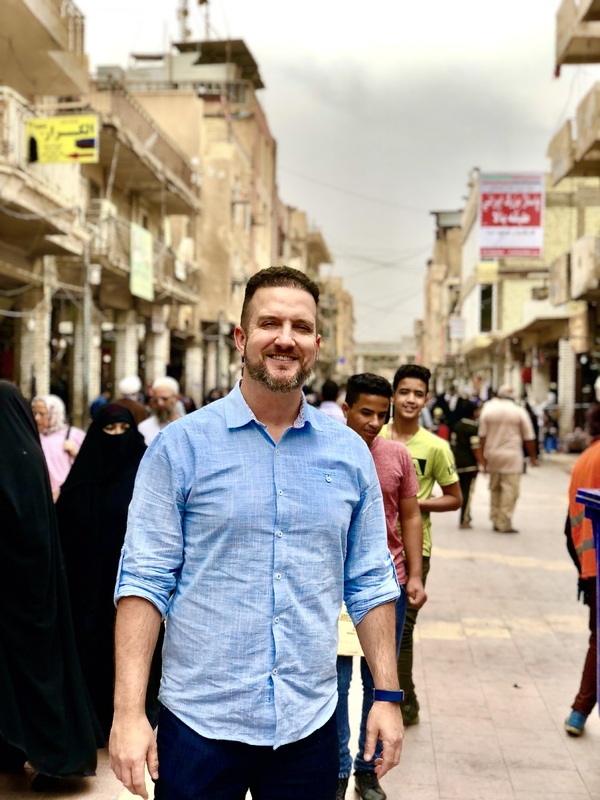 No lie, I was a little nervous at first, as we walked through the bustling streets of Iraq. Would people know I was American? Would they hate me? Would they want to harass me? Harm me? Kidnap me? Throw rocks at me? I walked in between Adam (in the front), and his brother (and our driver) Moussa, behind me. I felt a little safer knowing I was sandwiched in between my two “guards.” I felt as if they were my “secret service,” and that something could go down at anytime. But that was all in my head. 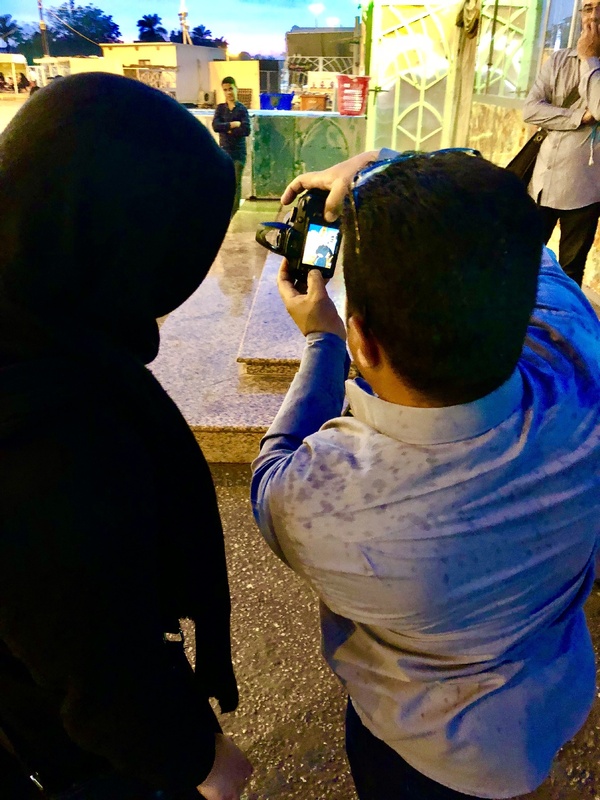 It wasn’t but minutes later I was snapping away with my iPhone, shaking hands with new friends, and even being asked to take selfies with strangers–folks who were enamored with meeting an American. This was going to be a great visit. 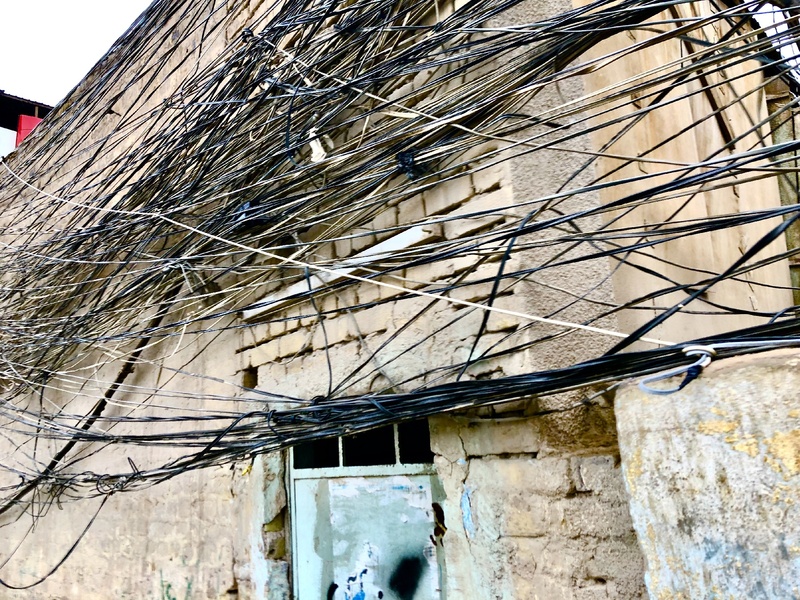 Many of these wires were connected to generators. The city’s power is unreliable. 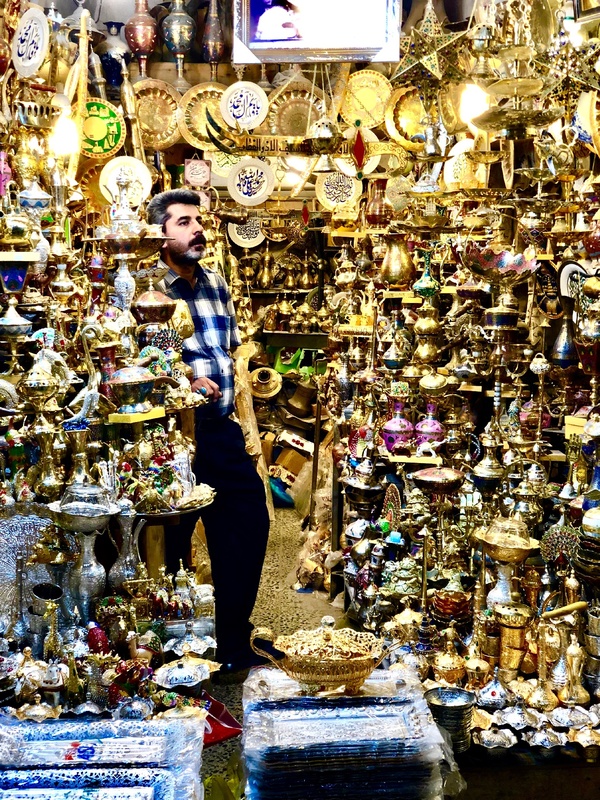 Our first stop was a stroll through the bazaar. I could’ve roamed those corridors for days. There was so much to look at, and so many amazing photo ops. I’d only been in the country for a few hours, and was still a little nervous about taking photos, so I’d ask Adam each time I wanted to take a picture. As the trip went on, I became more relaxed. But man, if you could’ve seen what I saw–through my eyes–just fascinating stuff, especially the people. 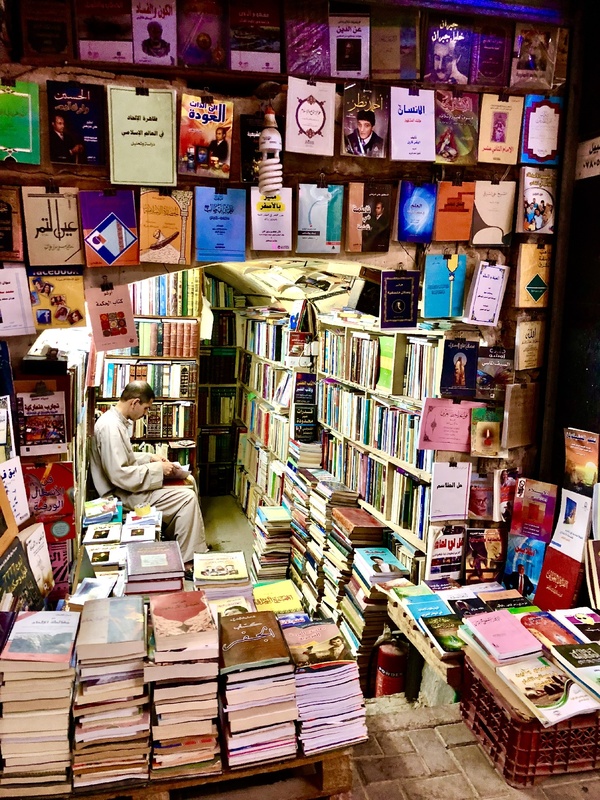 While everything seemed so foreign to me–like something I’d see in an Indiana Jones movie–it’s always surreal when you realize this is just everyday life for these folks. 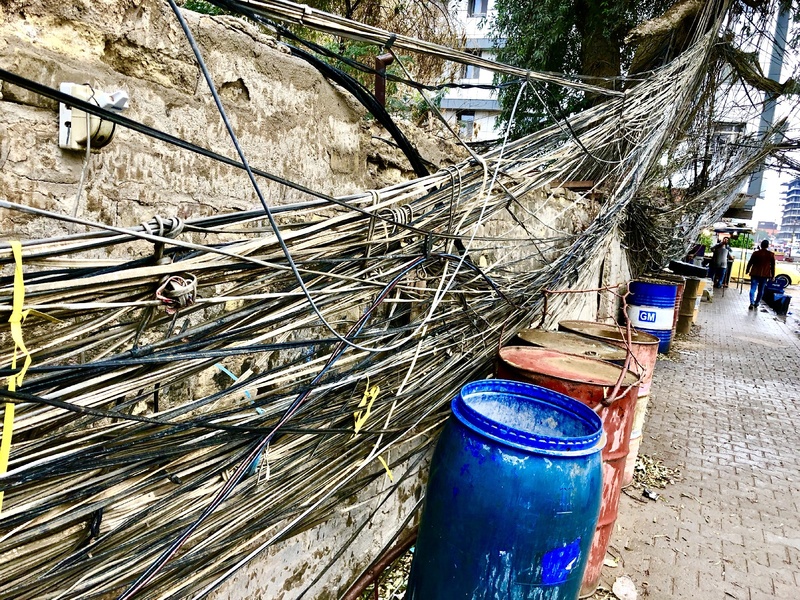 I soaked up every second–taking in the smells, sights and sounds–and trying hard not to be too distracted by it all and walk into a pole or trip over a pothole. Oh, and the treats! 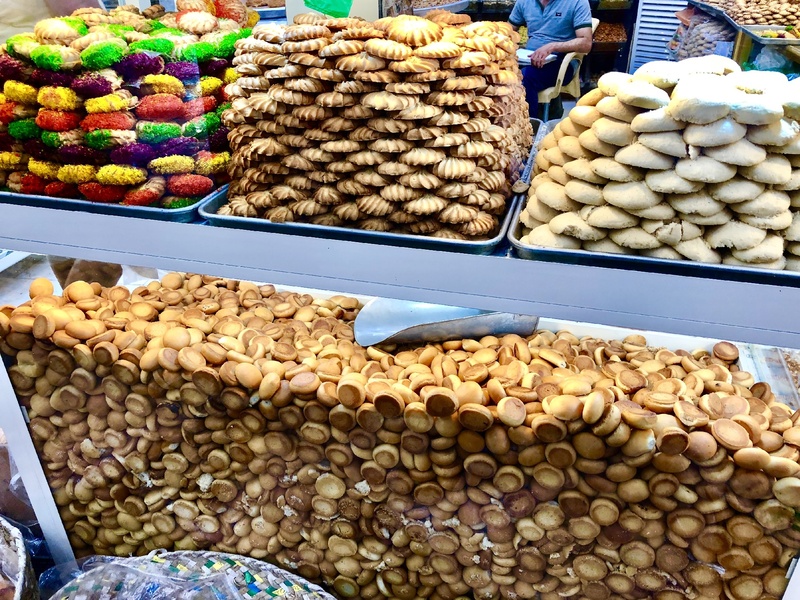 So many stands with fresh baked goods. The first thing I was taken aback by, were these enormous pans of some sort of pie or dessert. They were huge, and folks would buy slices of this sweet stuff. 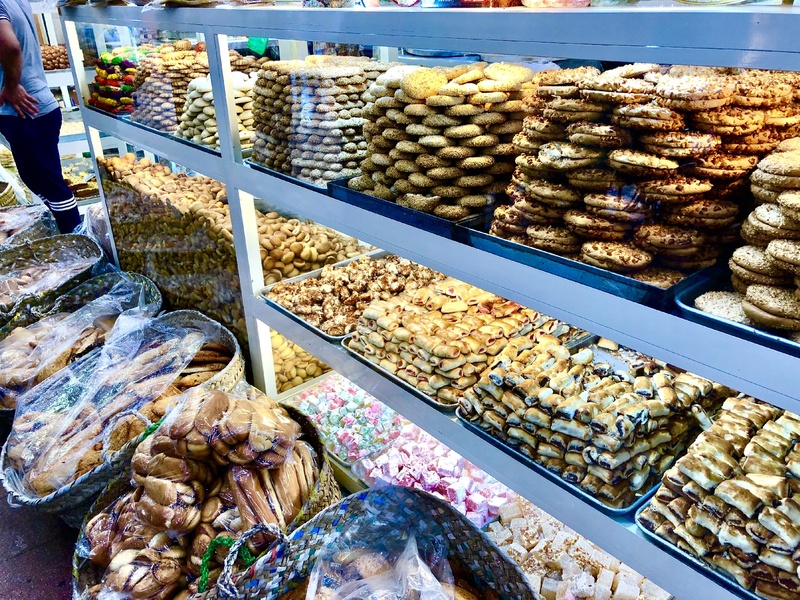 There were plenty of cookies, donuts, baklava, and kanafeh. 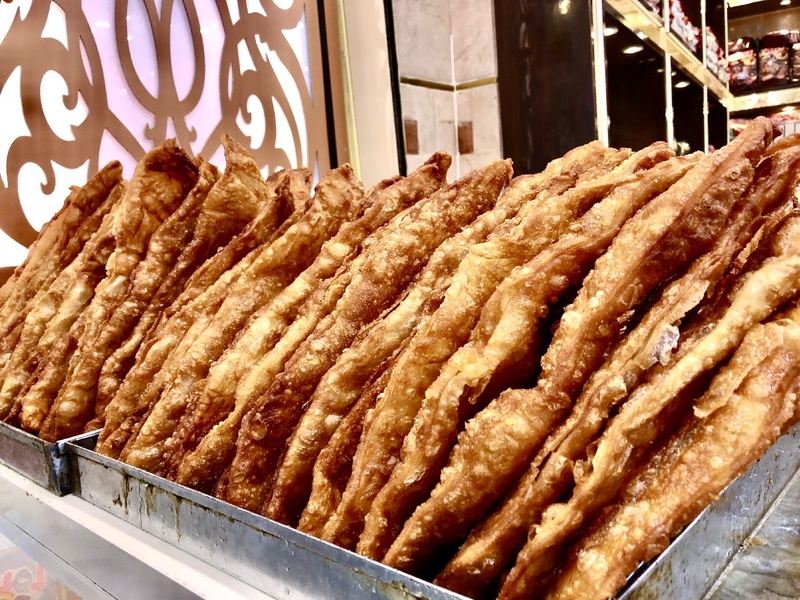 I even saw Iraq’s version of the “churro.” I may have gotten diabetes just from the sight of all this good stuff. I had to stand strong…lunch would be soon. The Cookie Monster would go nuts here. Donut holes and baklava for days. 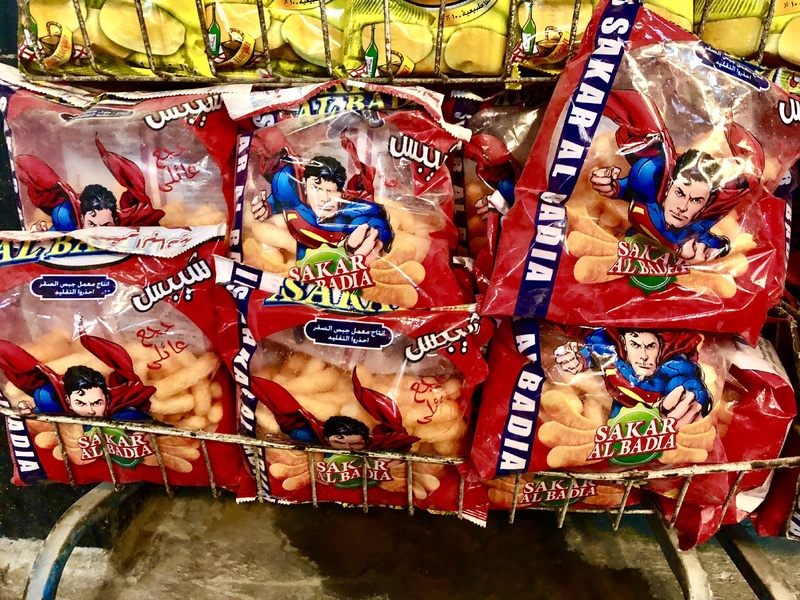 It’s a bird…it’s a plane…it’s a snack! 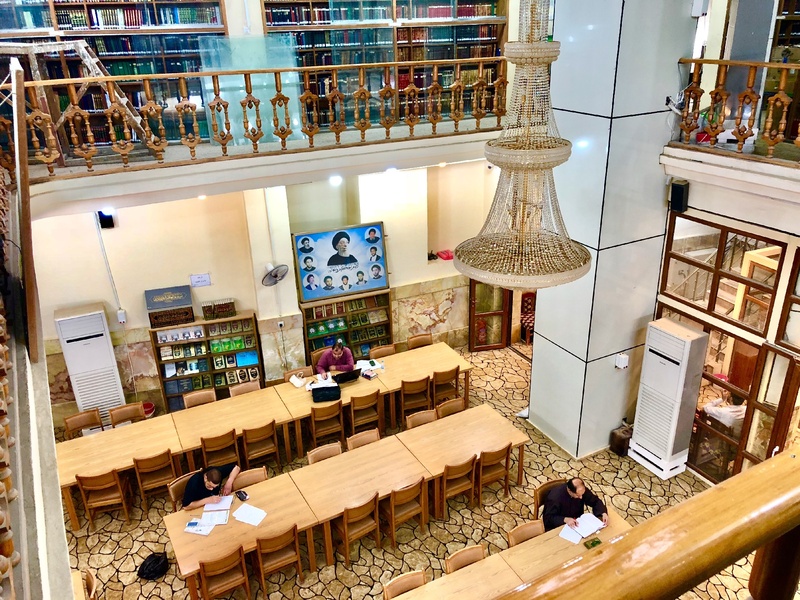 After some quality time strolling the bazaar, Adam took me to a large building: “Safi al Yamani.” The structure contained worship rooms, places to study, a museum, and even dormitories to house guests visiting during religious pilgrimages. Near the end of the tour, I was ushered into a very fancy, large office, and met the building’s head honcho. This was “the” guy here. I was offered to sit in a room that looked as official as The Oval Office, and was even brought drinks. We had nice small talk for a few minutes, before I was given some gifts (a book about the building and a sash), and then posed for photos. Honestly, I had no idea what was going on, but I liked it! It felt like I was some important ambassador on a special visit. Sounds silly maybe, but I really felt special. The gentleman was so nice and welcoming to me. What did I do to deserve all this?! What hospitality! 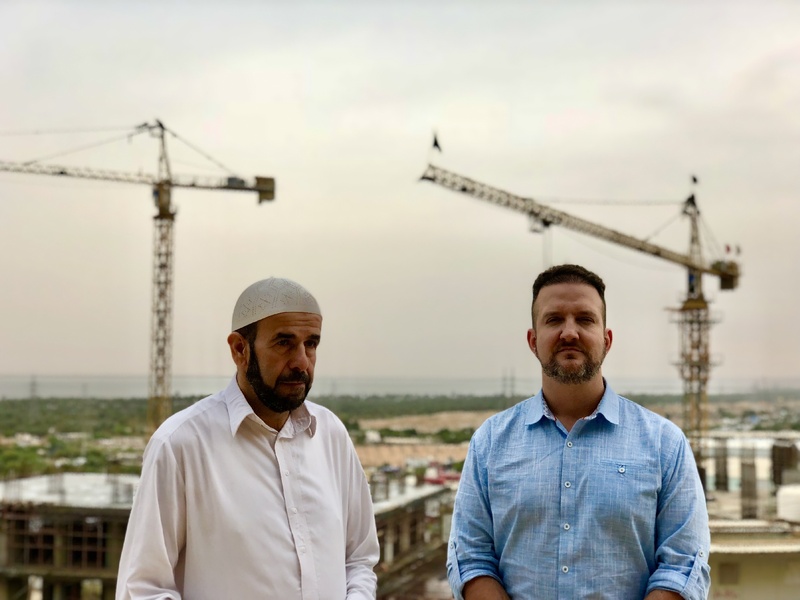 A special welcome at Safi al Yamani. Pictures on the rooftop with one of the building guides. 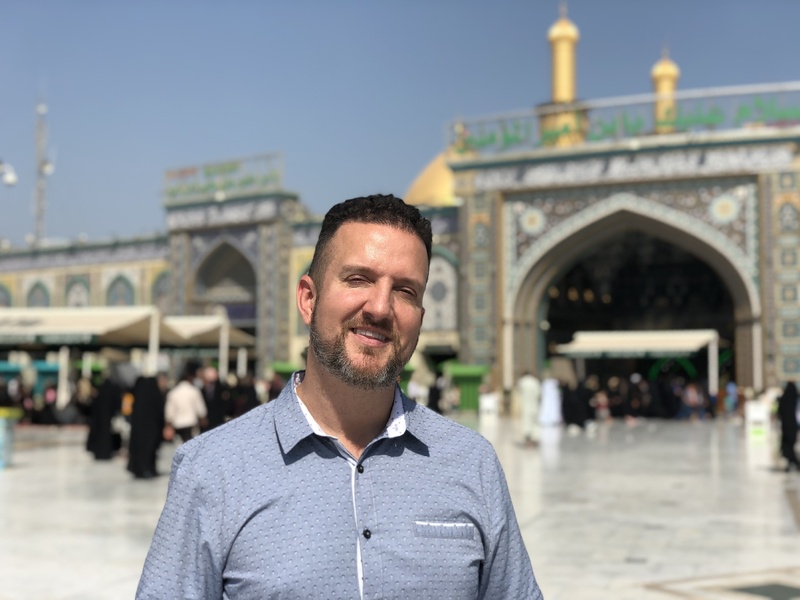 After the very cordial visit, it was off to see some very special and historical sights, including the Imam Ali Mosque and the world’s largest cemetery. 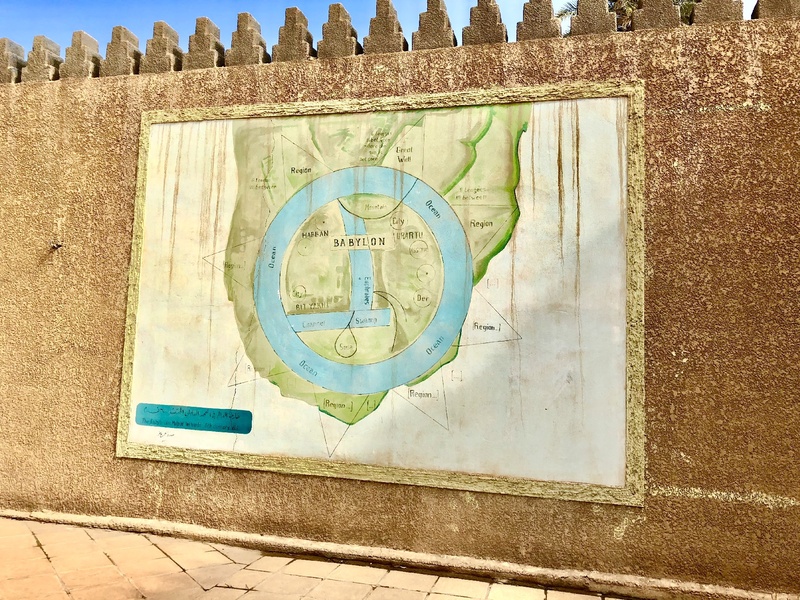 A U.N. Heritage Site, Wadi-us-Salaam translates to “The Valley of Peace,” and is home to over five million bodies, and counting! 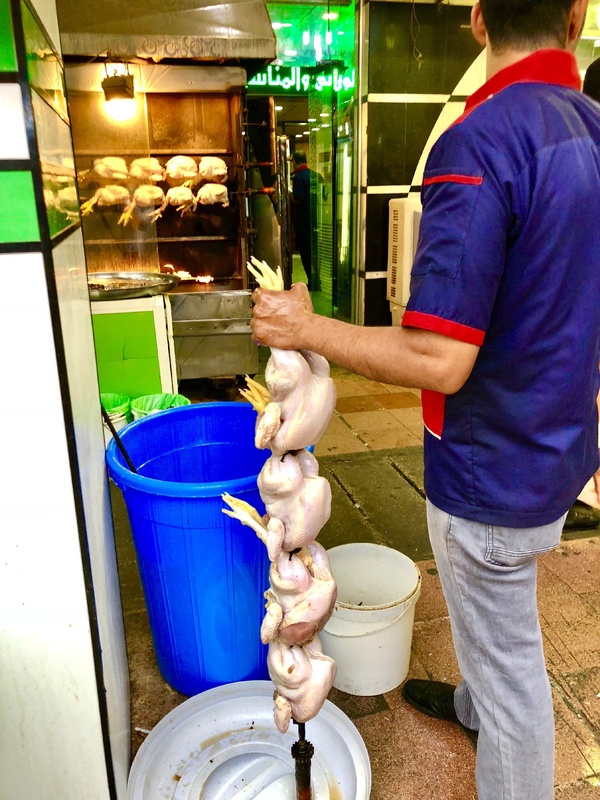 In fact, while we were hanging around the area, I must have seen at least a half-dozen wooden caskets being carried down the street on the shoulders of men, on the way for burial. 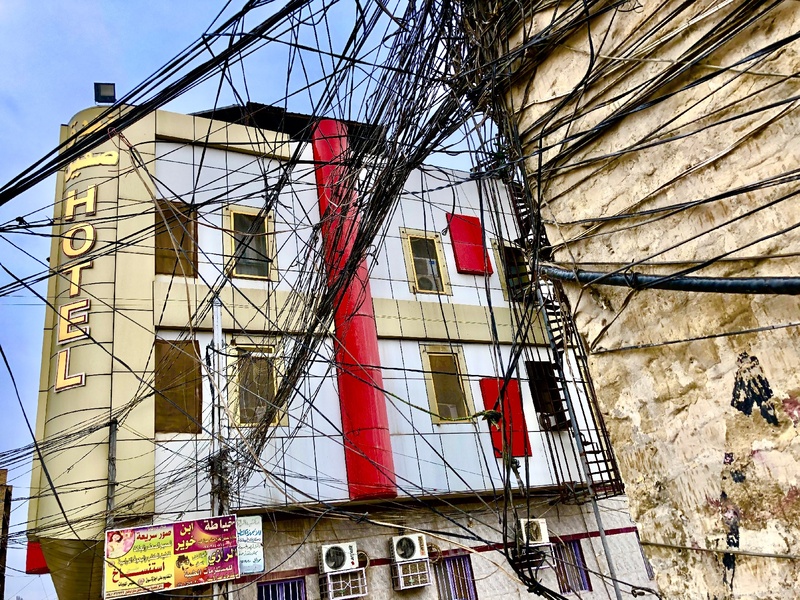 Interesting architecture; this building constructed after the fall of Saddam Hussein, who outlawed all construction of buildings more than two stories. 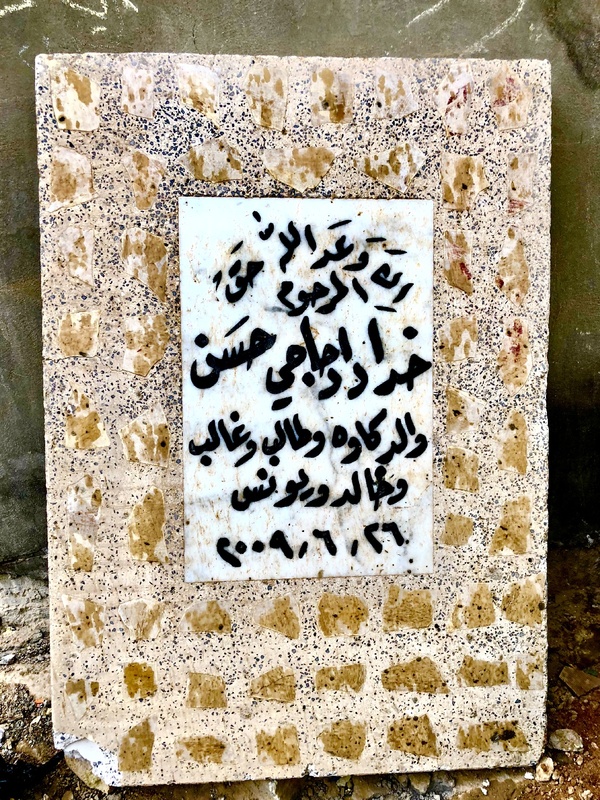 A soon to be used grave marker. One thing that helped quickly put my mind to ease, were the multiple layers of security and checkpoints completely surrounding the town center. Before you could even enter many of these areas, bags were searched and people were patted down. The men and women had separate entrances. Throughout that first afternoon, we must have passed through at least seven or eight of these checkpoints, and that didn’t include each mosque’s individual secured entrance. If something bad was going to go down, it wouldn’t happen due to lax security. 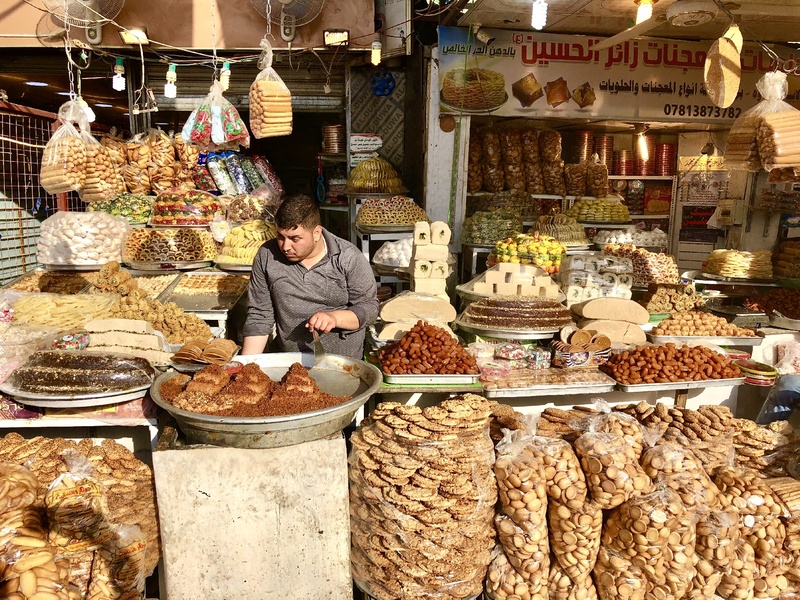 Najaf’s city center was on guard and at attention. 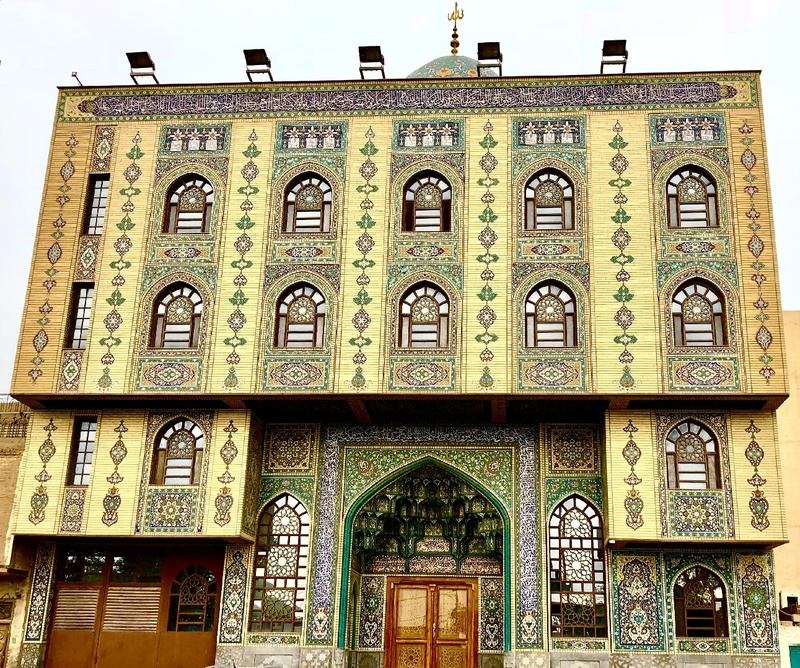 Also, Najaf is a secure city, unlike Mosul, which still poses threats. 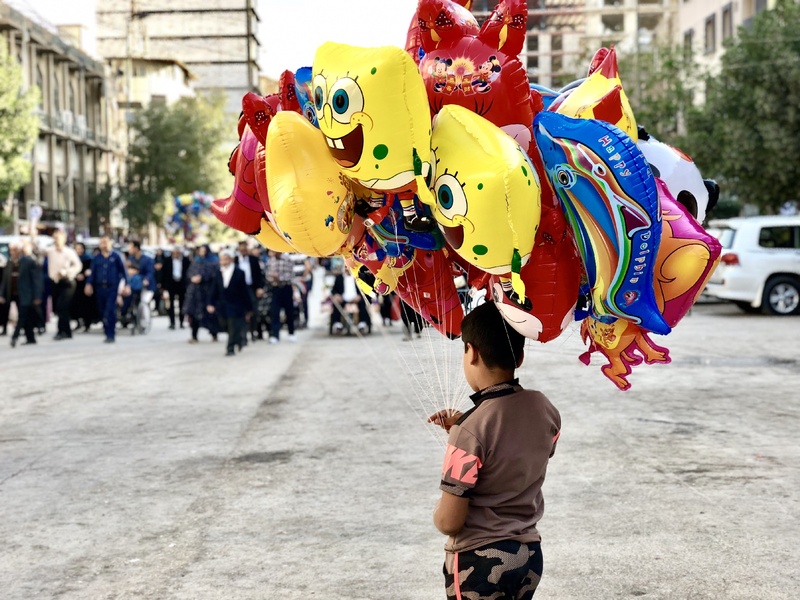 Adam told me a story of his clients wanting to see Mosul, and that he’d refused. 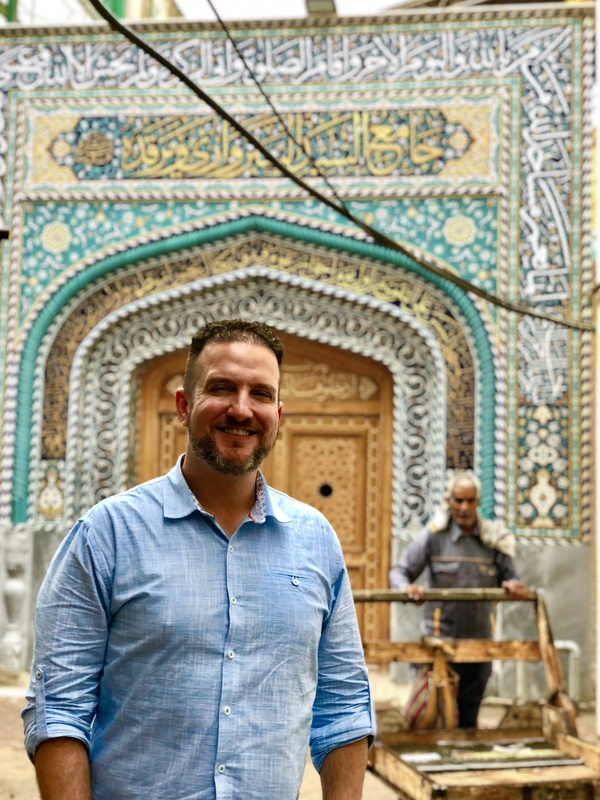 Adam tells me Baghdad is still a tad dodgy, but Najaf has long been tranquil and secure. We’d walked a lot, it was getting late, and my stomach was rumbling. Time to eat. We stopped in one of Adam’s favorite places–a joint he liked to take tourists because “everything was new, no leftovers,” he boasted. And boy was the food good, and plenty. Not five minutes after we were seated, did over a dozen plates appear. You would have thought it was Thanksgiving. For the next hour we stuffed ourselves! Lots of freshly baked bread, rice, lamb, chicken, beef, beans, watermelon, salad, hummus, veggies, fruit and this little custard in a cup for dessert. It was the fuel we needed for a busy day and man, did I leave stuffed! Before leaving the restaurant, I thought it was neat that the waiter asked to take a selfie with me, solely based on the fact that I was American. 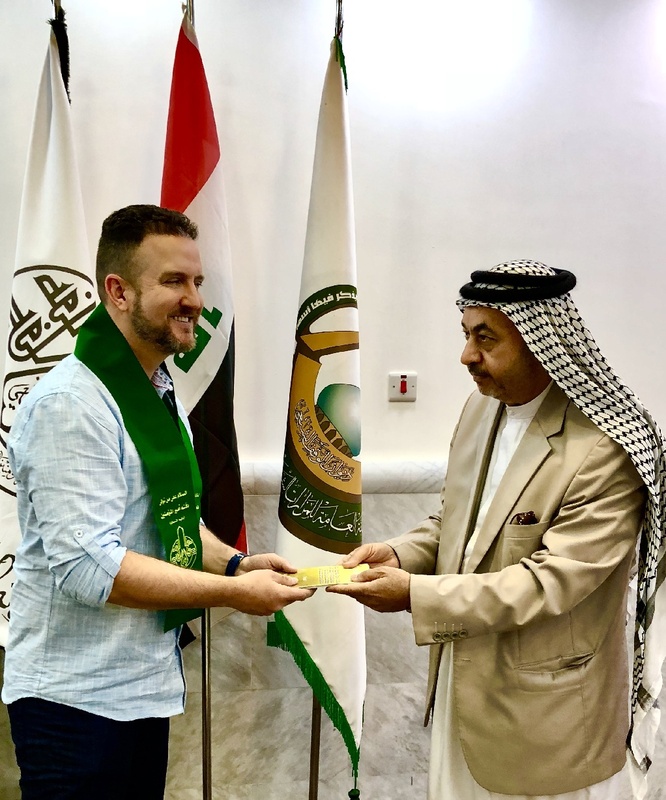 In fact, this would happen often throughout my two days in Iraq; random strangers so happy to see an American visiting, wanting to practice their English, take photos and oh, the smiles. But wait, doesn’t everyone from the Middle East hate us? You see, this is why I love to travel, and why I wish more people traveled. Not once did I receive any negative vibes whatsoever, from anyone, while I was in Iraq. On the contrary, people went out of their way to welcome me and show me love; and you’ll see more evidence of this as you scroll down. 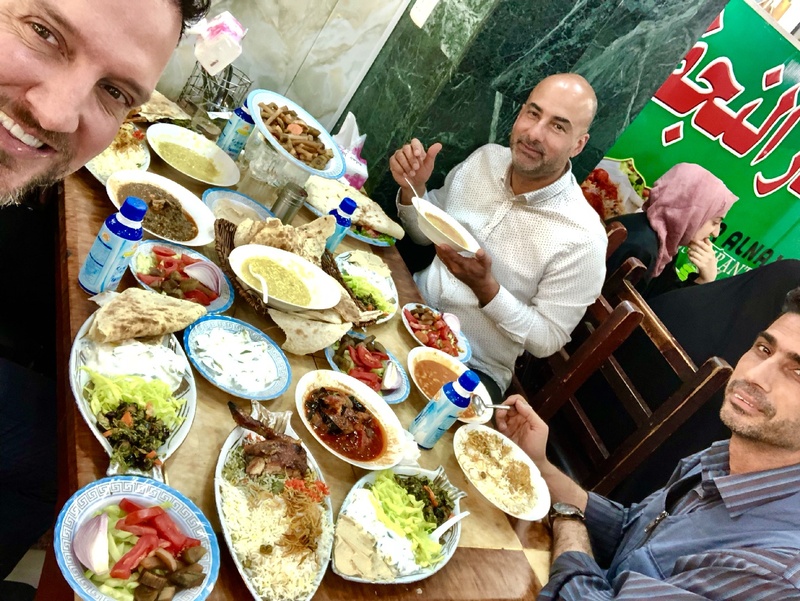 Had I never visited the Middle East, I might have believed the media’s narrative that “they all want to kill us.” Fact is, I’ve never felt more loved. 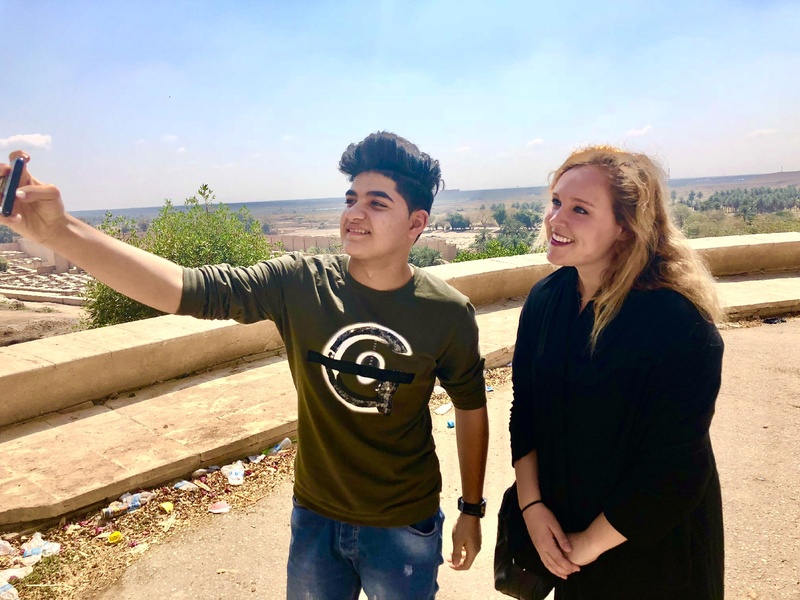 An Iraqi youth excitedly steals a selfie with one of our group’s travelers: Katelyn Jarvis. Everywhere we went they just loved her blonde hair (when it wasn’t covered). 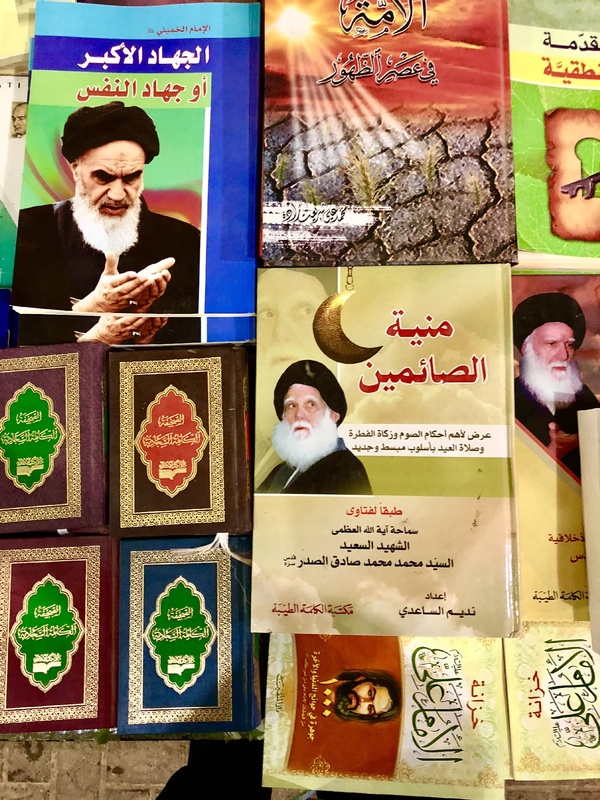 The Ayatollah Khomeini spent 14 years in exile, and most of that time was spent in Najaf. That house, in the center of town, is now a museum, which I spent a good time exploring. Then it was over to tour a library. 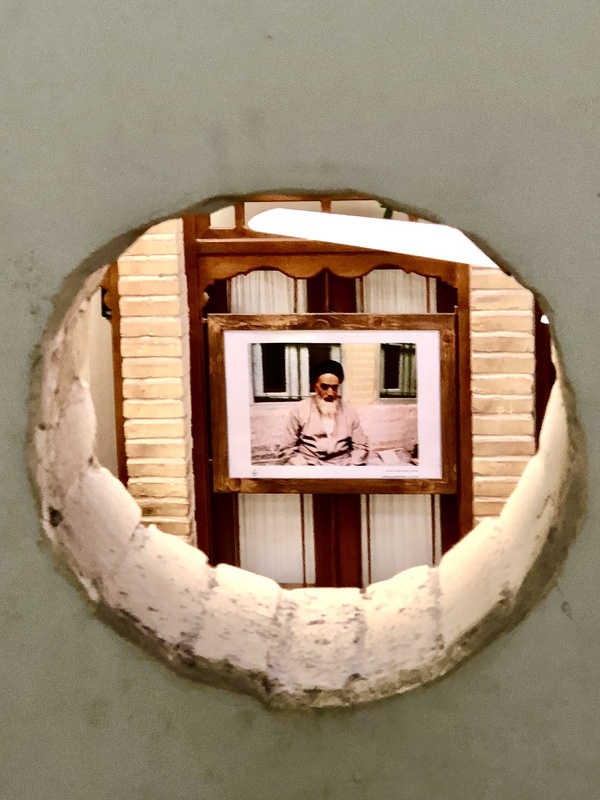 Ayatollah Khomeini home turned museum. I spy the Ayatollah Khomeini. 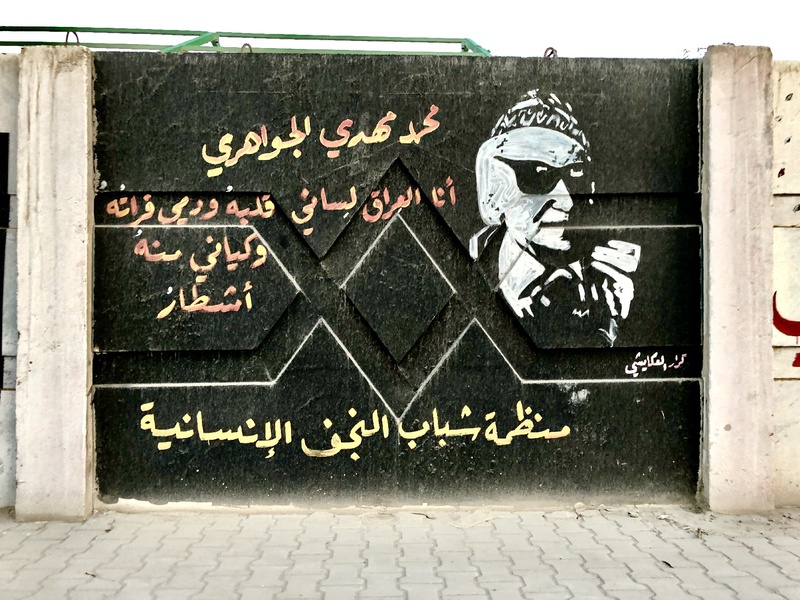 One thing was clearly evident, Iraqis sure are serious about their religion. 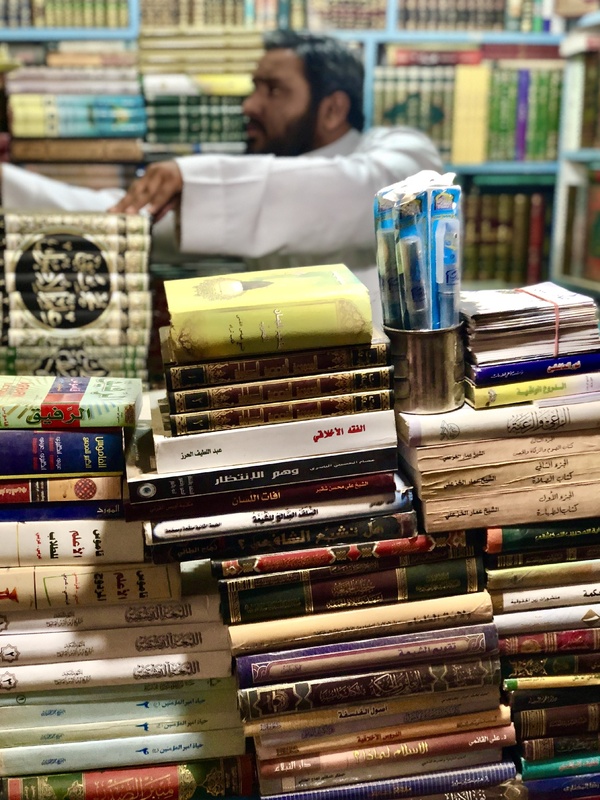 From the masses heeding the call to prayer, paying respects at the tombs of holy imams, and studying in the libraries; these were a people very serious about Islam. Half of the men were dressed in long shirt/robes called dishdashas, and most of the women were covered with hijabs and burqas. 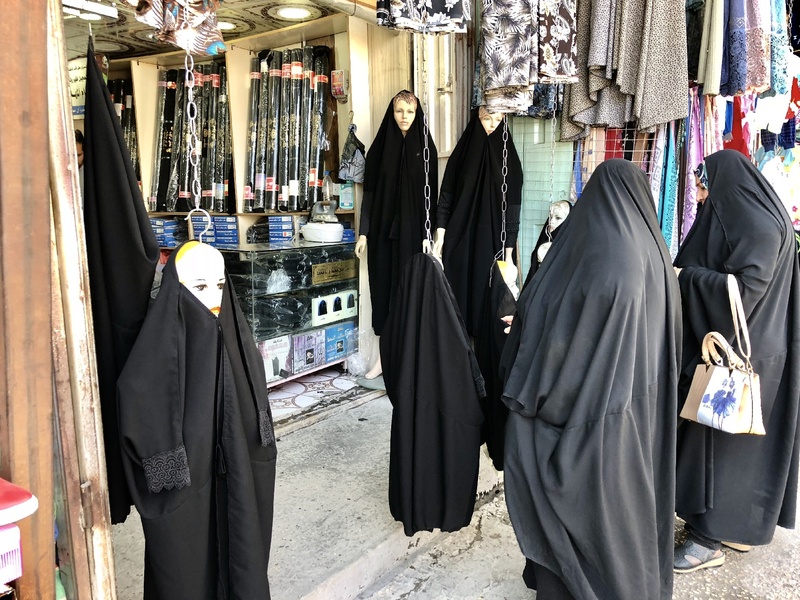 A small percentage of the burqas only revealed the woman’s eyes, and I even saw a handful that contained a full black veil covering the eyes. Adam’s wife (who I’d meet the next day) explained an interesting philosophy on why women who cover themselves are actually more “free” than the females who don’t. Her explanation: the women that keep themselves covered hold the power to choose who “sees” them and who doesn’t; whereas the woman showing off her body has no control of who puts their eyes on them. I’d never thought of it that way. The religion doesn’t allow females to touch other males, even for handshakes. 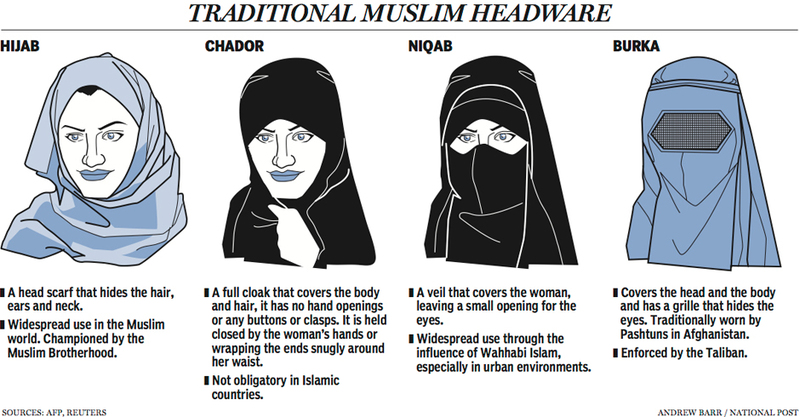 And I’ve known for awhile that it isn’t appropriate to photograph Muslim women. 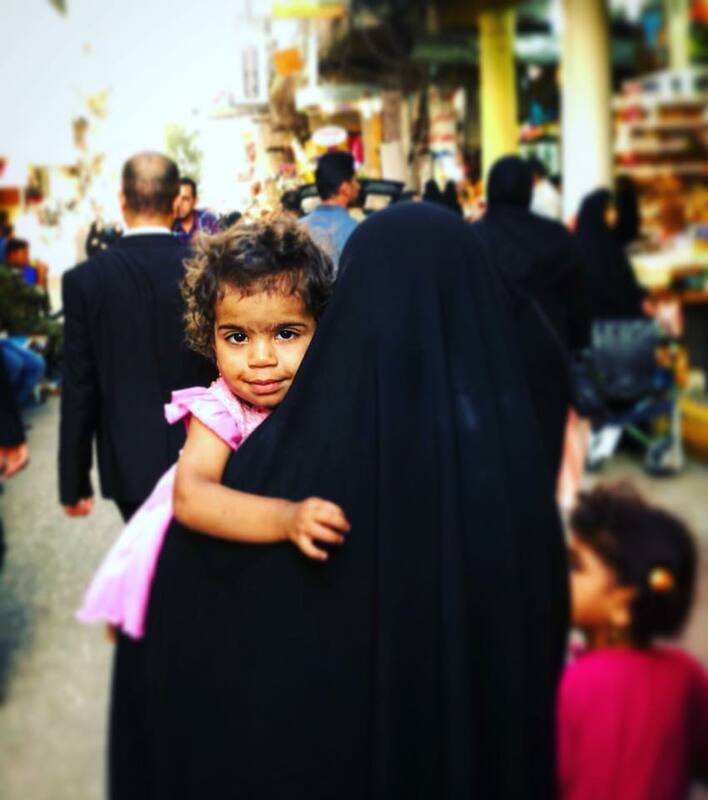 I’m not gonna lie, even wrapped up in hijabs, I could tell that many Iraqi women I was passing on the street were stunners…especially the rare ones with blue eyes. Those eyes could pierce your soul! But I’d keep my eyes moving at all times, even when I’d catch a smile from a young lady. The last stop for the night was a trip to a city called Kufa, about six miles out of town. 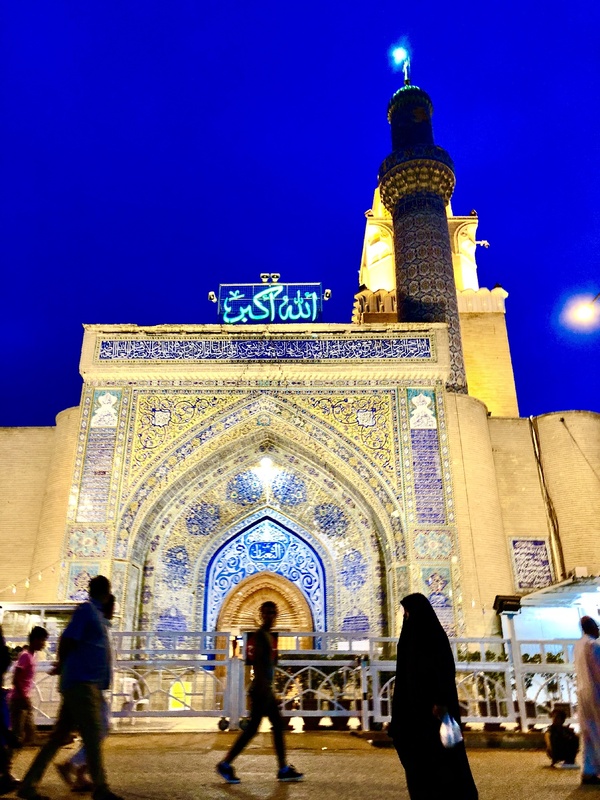 The sun had set and we had a nice evening stroll in and around The Grand Mosque of Kufa. Like all the mosques I’d seen that first day, the inside was ornate, pristine and super-detailed; with tons of gold, silver, mirrors and tile. 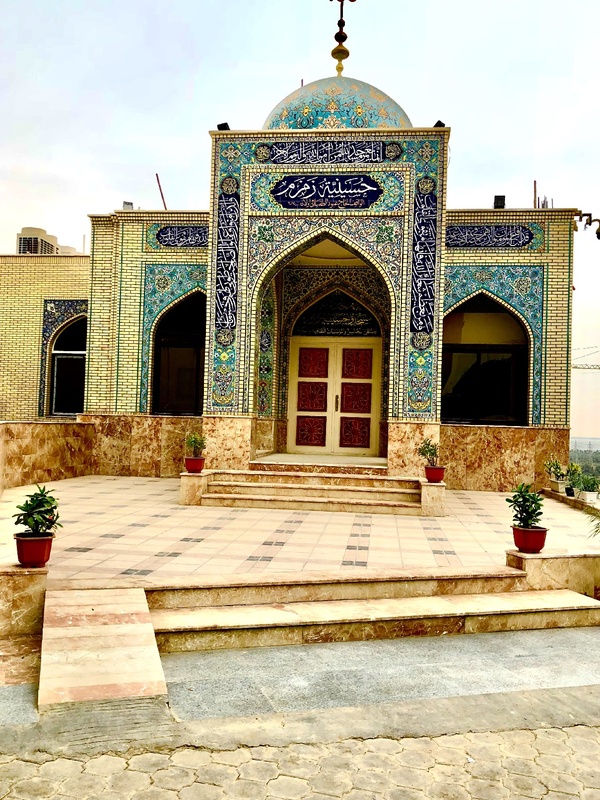 Cameras aren’t allowed into most mosques, so you’ll have to take my word for it, when I say the inside of these mosques was like nothing I’d ever seen before. 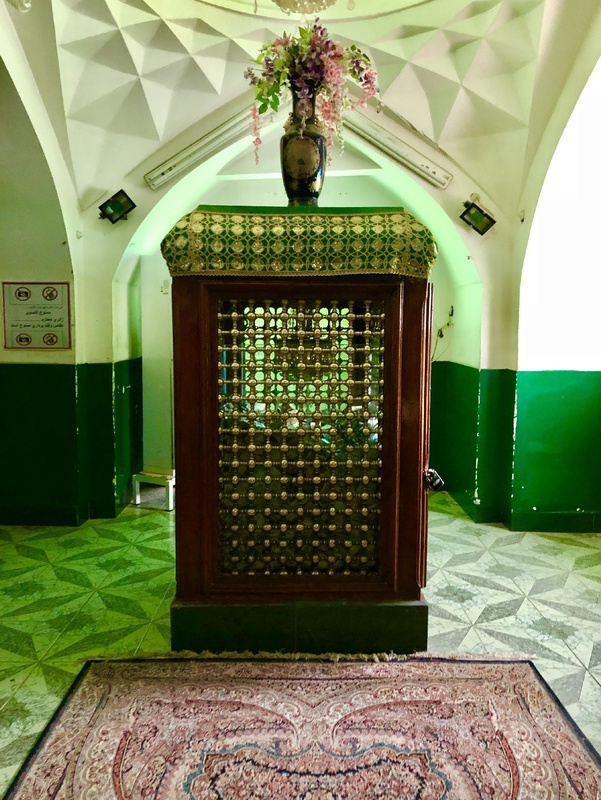 And they were busy, with most of the people crowding around the grandiose tombs of the holy imams; just to get a “touch” of the gold and silver cages that surrounded the grave. The worshipers would caress, rub and even give loving kisses to the tombs’ surrounding metal. Some would push money through the grates. A stranger stops to help a struggling fellow American traveler in our group (Katelyn Jarvis) adjust the settings on her camera. I arrived back at the hotel around 7PM and I was pooped. I clocked in over 20,000 steps on the ol’ FitBit and my dogs were barking. It felt good to be horizontal for a bit, but I couldn’t resist the urge to explore a little more before bedtime. 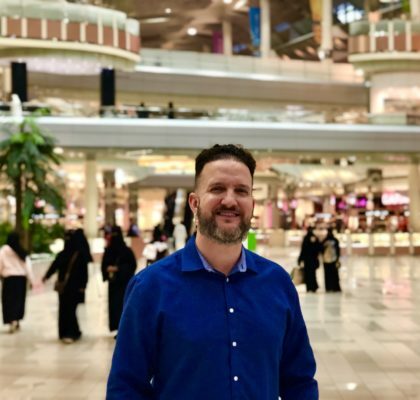 Adam advised me that a walk down the main boulevard (Al Rawan Street) would be fine, so I took a stroll. The walk was uneventful, passing mostly newer construction: fast food restaurants, shoe stores, a hookah lounge, etc. I walked about three fourths of a mile before turning around and heading back. I stopped into the mall that was across from my hotel for a cup of the best lemon ice cream I’ve had in my life, then it was lights out. A great first day in Iraq. Day 2: Soldiers pose for a celebratory “100 Countries” photo at the entrance to Babylon. It was Saturday, and my only full day in Iraq. We’d get a lot accomplished! It was up and at ’em and on the road by 7:30AM. 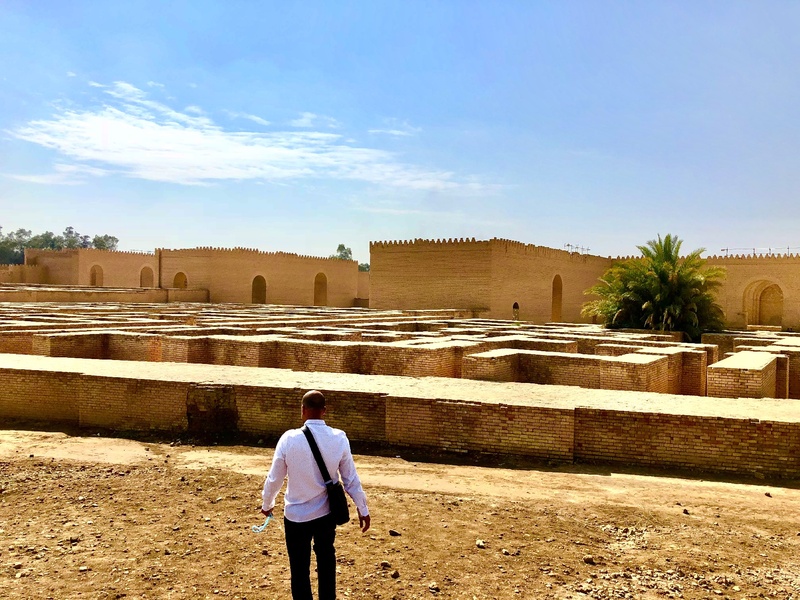 We’d head out of town and over to one of the most famous and ancient sites in the world: Babylon, where I spent the next few hours in complete awe. 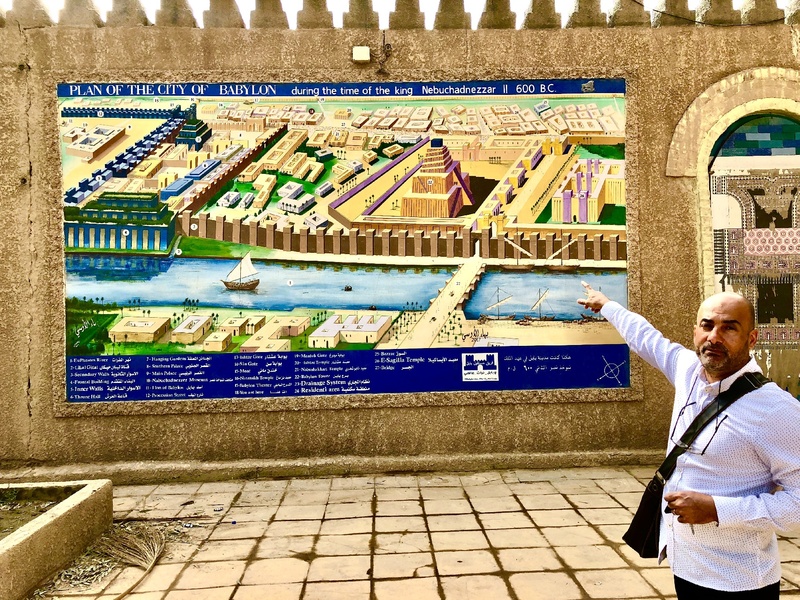 Built on the Euphrates river, Babylon was a kingdom in ancient Mesopotamia that was in business from the 18th to 6th centuries BC. Adam and one of the guides on-site provided such expert and detailed commentary as we explored the grounds of this wonder. I can’t explain just how surreal it felt walking through this ancient land. 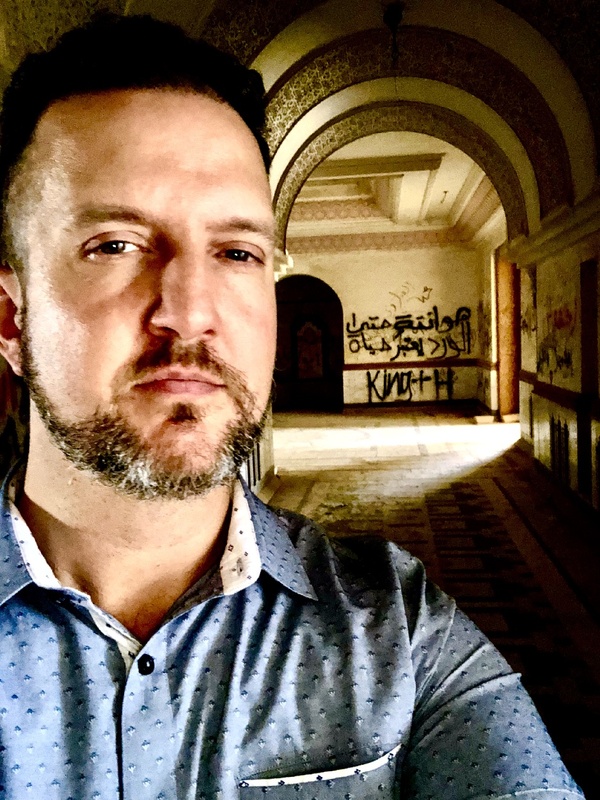 My body tingled and the hairs on my arms stood straight up as I wandered this special place–the location for so many epic stories and movies over time. And the best part? We were almost completely alone. I only encountered just a small handful of other tourists, and ran into them rarely. For the most part, it was just me and my guides. 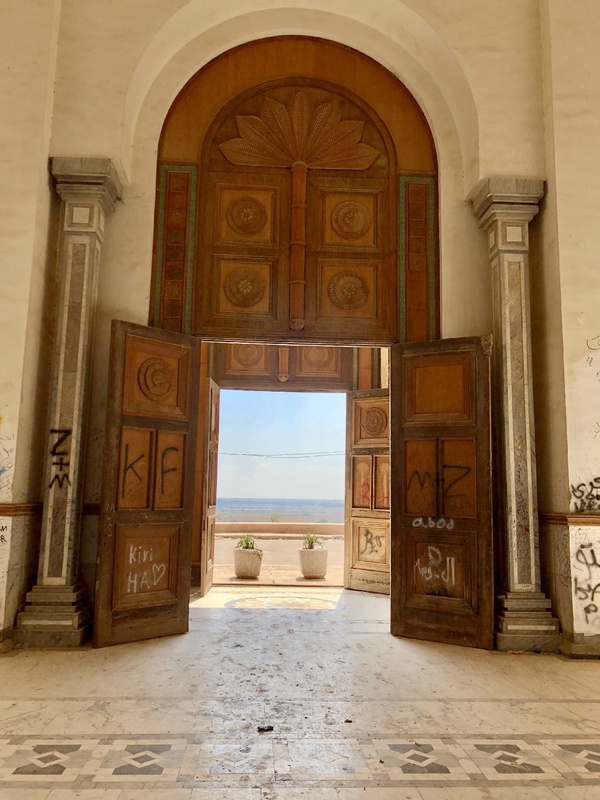 We had the place to ourselves; a far cry from most famous historic sites, like the Colosseum in Rome–where you’re among thousands, literally thousands of other tourists; fighting for just a little elbow room is futile, and forget about taking a selfie by yourself. You’re among the masses. Okay, enough talking…let’s see Babylon! 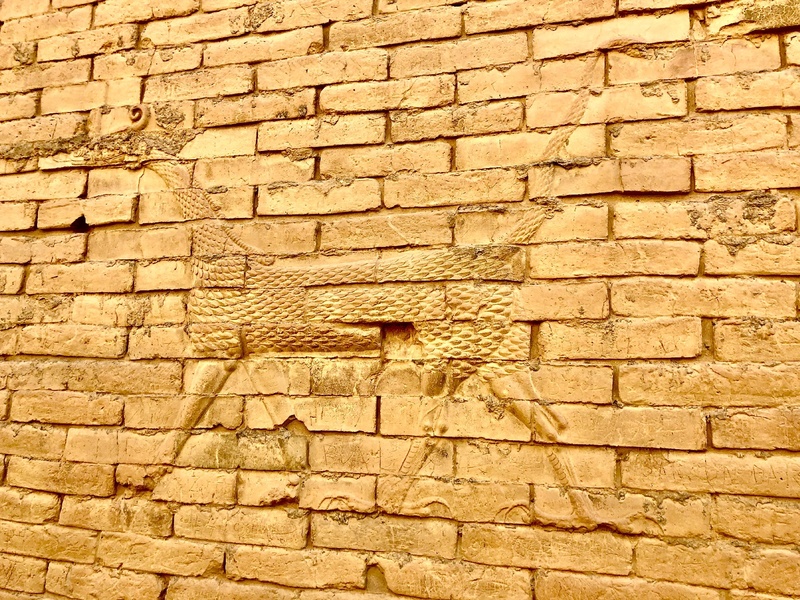 Marduk: the patron god of Babylon, the Babylonian king of the gods, who presided over justice, compassion, healing, regeneration, magic, and fairness. Huge brick walls and arcs. Standing in the exact place where Alexander the Great once presided. 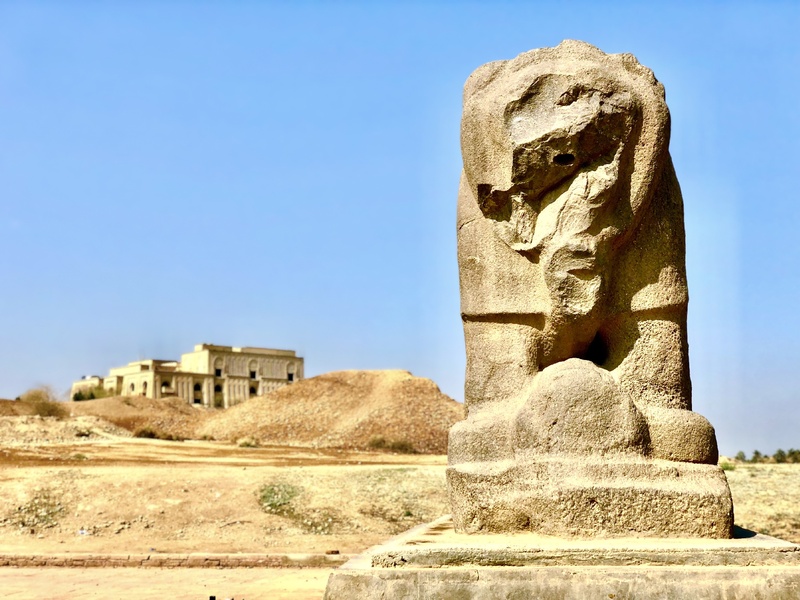 The Lion of Babylon was discovered in 1876 by a German archaeological mission. It gets better. 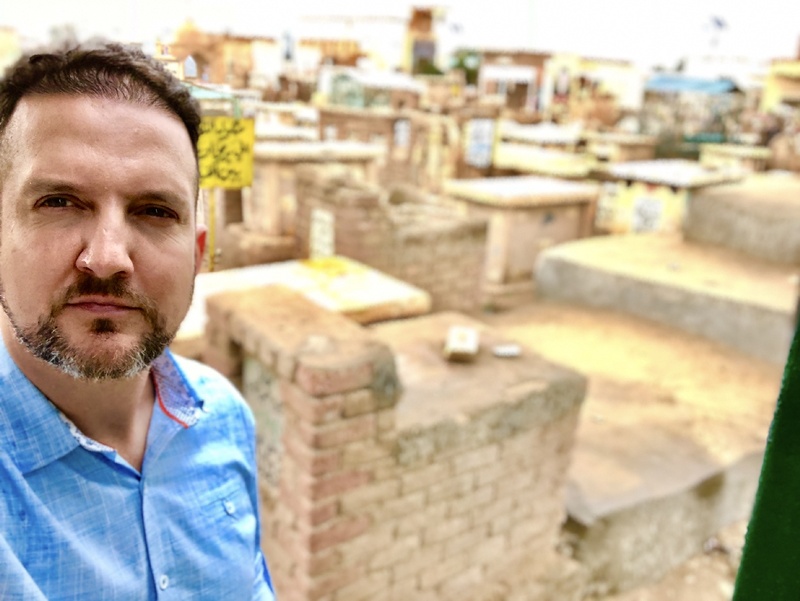 After wandering the area for about an hour, Adam takes me down to these real-life mazes, made of brick. The story goes that the mazes were constructed to slow down and confuse the enemy intruders. They’d get lost in the maze while trying to infiltrate the property. 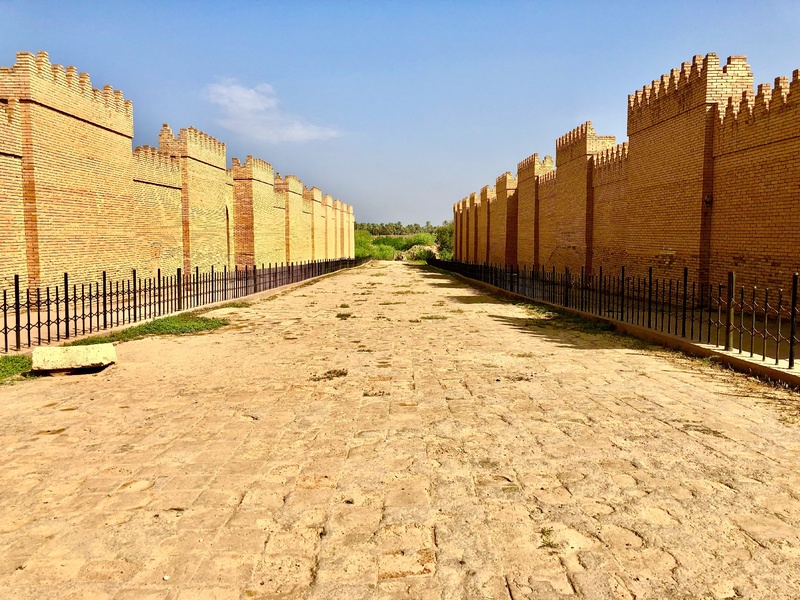 To make it worse, the Babylonians, standing on top of the maze’s walls, would then pour scalding-hot oil down onto to the enemies. Savage. 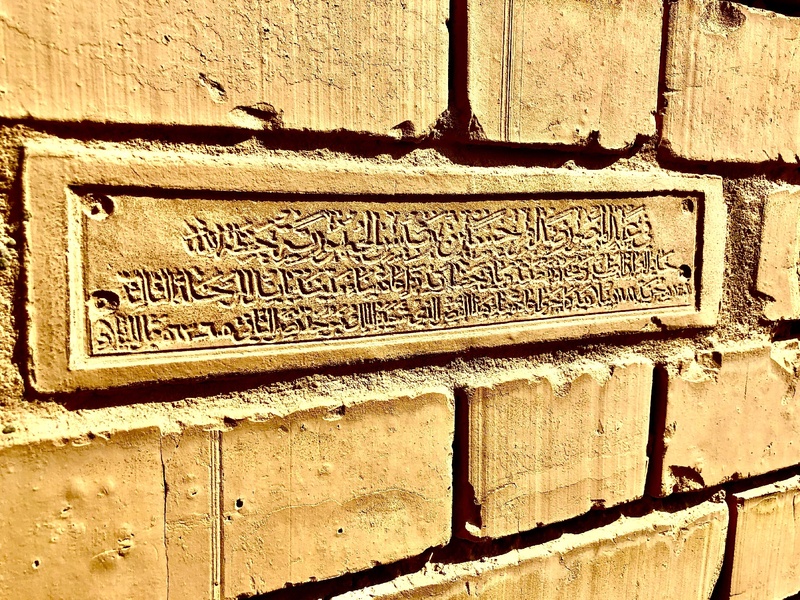 While refurbishing the walls, Saddam made sure to let it be known it was his doing–ordering hundreds of bricks with his message to be laid into the wall. Ancient tablets just laying around. 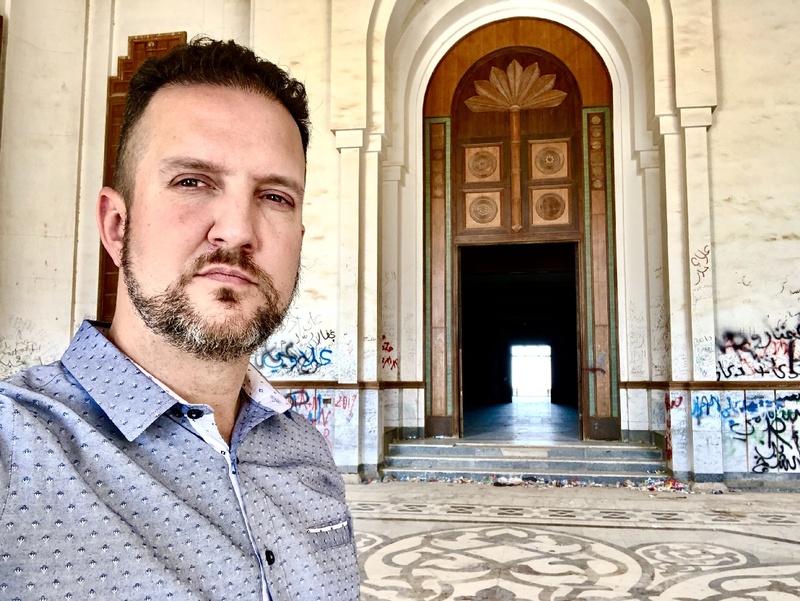 What happened next was probably the highlight of the entire trip, as I was allowed to wander the corridors of Saddam Hussein‘s palace. 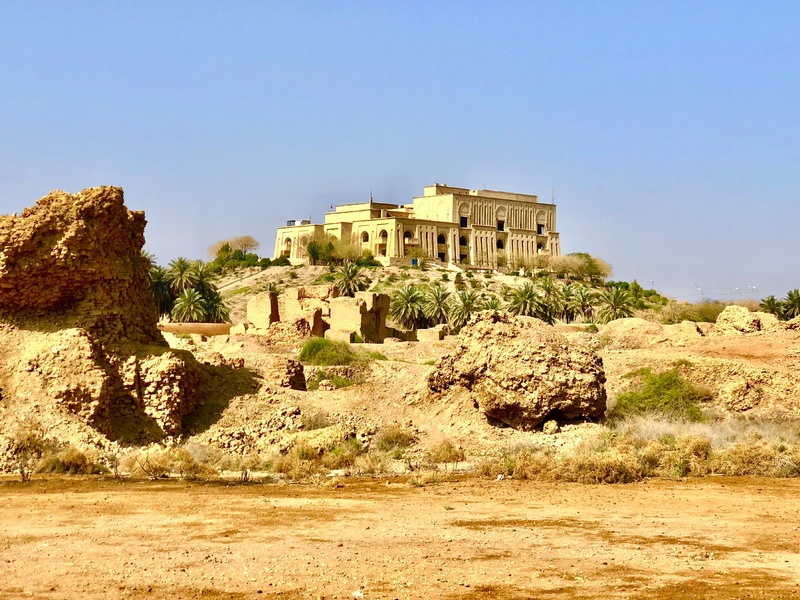 This giant building perched high atop a hill overlooking Babylon looked like one part mansion, one part fortress and one part Disneyland attraction–like the outside of the Indiana Jones ride! I couldn’t believe I was going to be let in to the palace and given permission to poke around, like an open house. This was just the neatest thing ever! 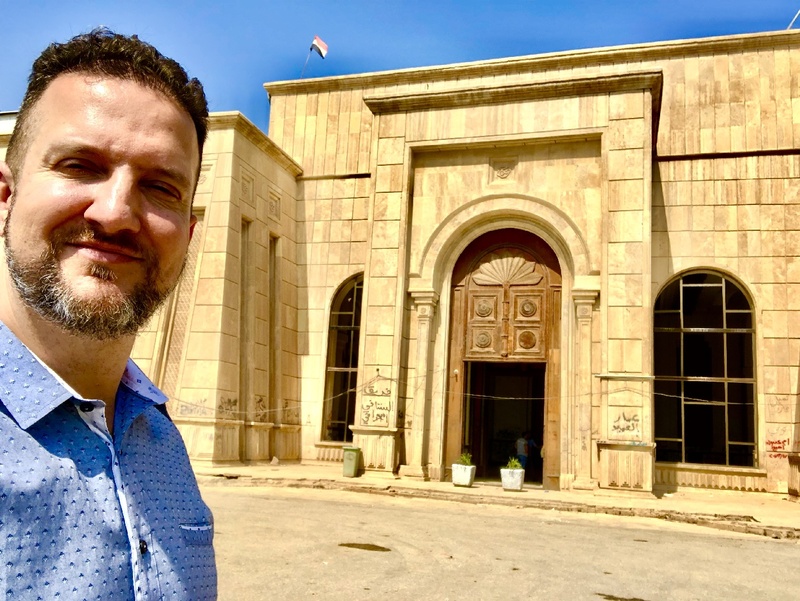 One of Saddam’s 18 palaces. It reminded me of Tony Montana’s mansion in Grand Theft Auto – Vice City. 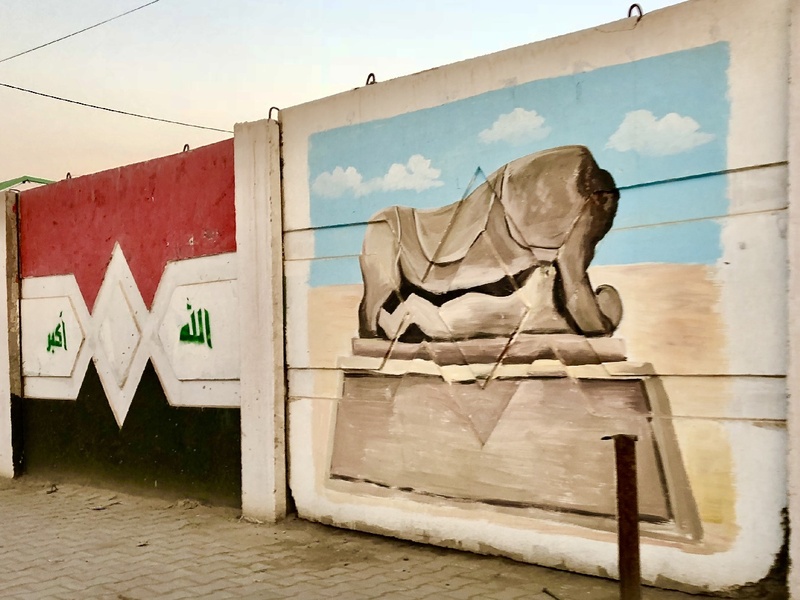 Saddam’s image, name and messaging was everywhere. Expensive cedar from Lebanon adorned the doorways. Tall ceilings, Lebanese cedar and lots of marble. Vandals have left their mark over the years. 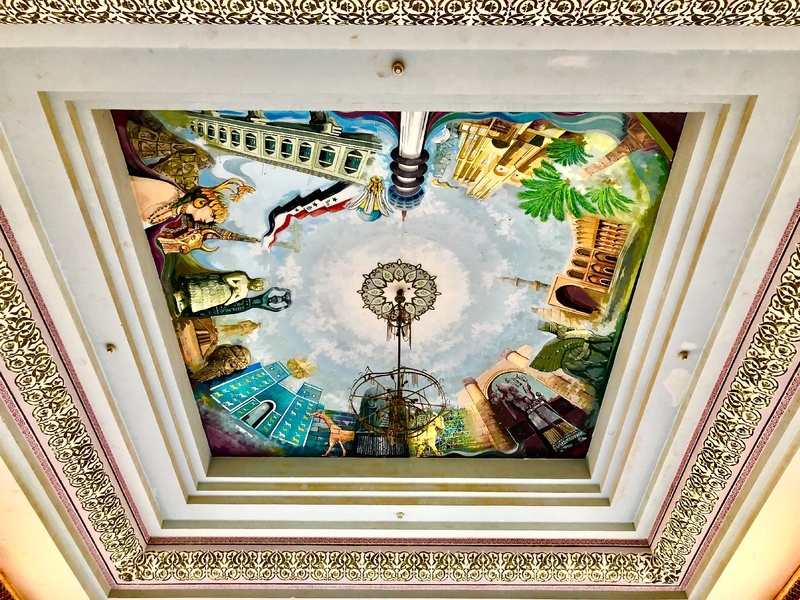 Out of reach, this fresco ceiling painting has remained unharmed. 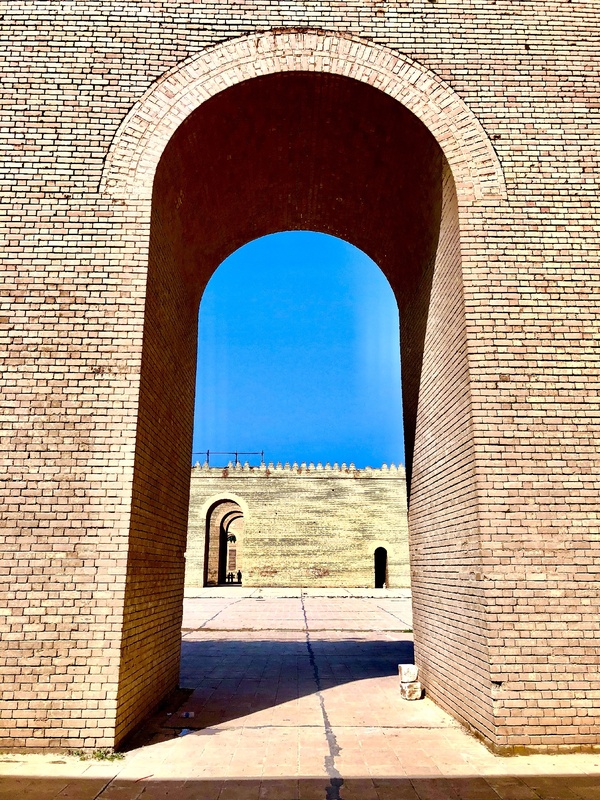 The doors open to stunning views of Babylon. Ever play Grand Theft Auto Vice City? This was like Tony Montana’s mansion, but in real life. And thankfully no one was shooting at me. I could only imagine what had went on, decades ago, in the very place I was standing now! Obviously the home had seen better days. 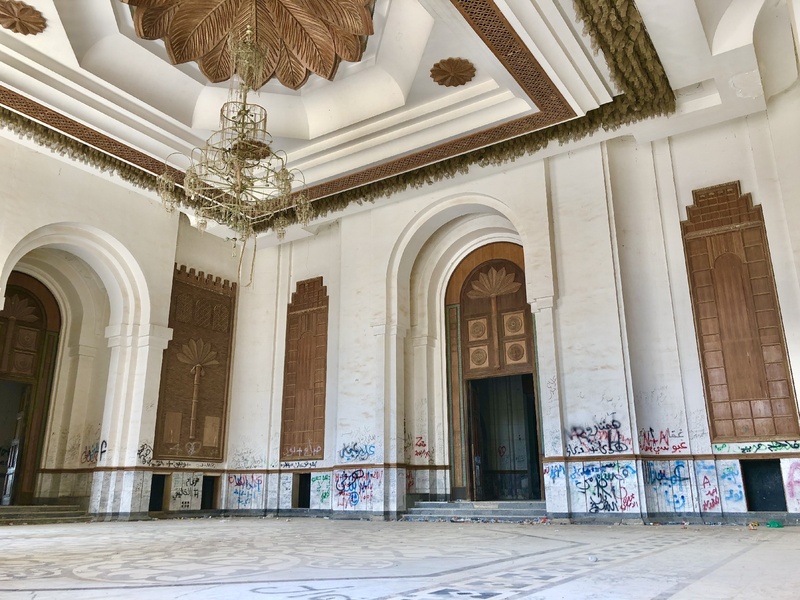 Between the war, the fall of Saddam and Iraq’s independence–and everything in-between–the palace had been ransacked, lived-in, neglected, weathered and vandalized. I thought it was interesting that the American military had used the palace as barracks during the war. Those guys must have some pretty incredible stories. I even spotted a few walls with graffiti and messages from the GI’s. But despite all the damage, the bones of this beautiful structure remained intact. 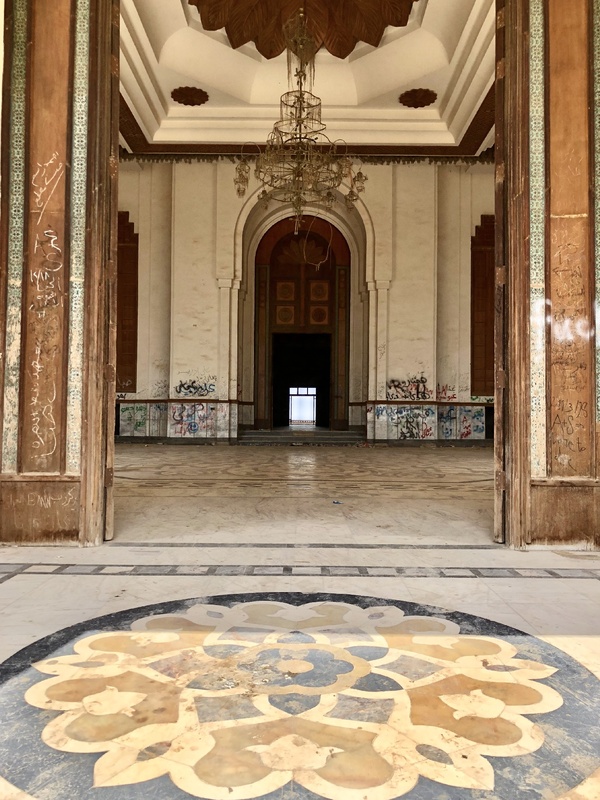 Most of the marble on the walls, floors and ceilings looked to be in solid shape, over half of the wood ornamentation remained (some with gold inserts), and the huge, colorful fresco painting on the main salon ceiling looked like it could have been put up just last week. I couldn’t help but think that this could be the best episode of Fixer Upper ever. Game over!!! 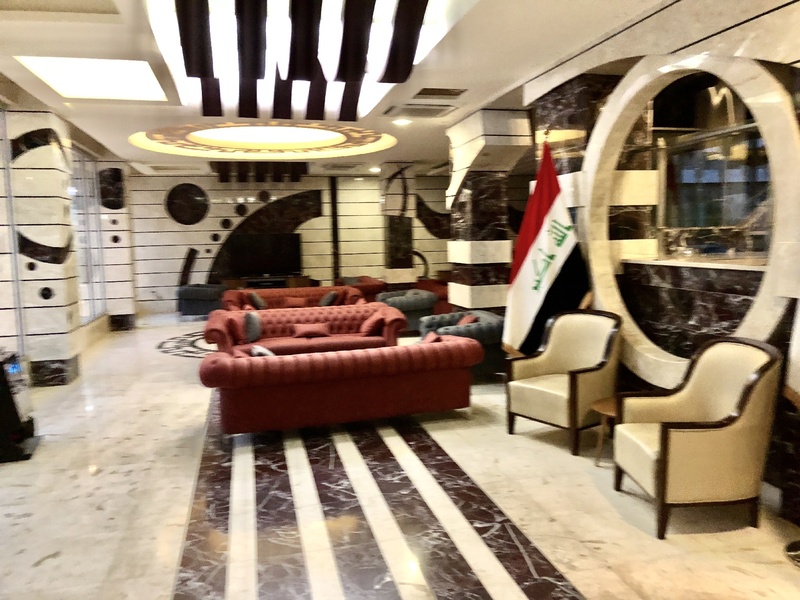 I toured the living room, dining room, bedroom (with its own reception), and bathroom; even managing to take seat in Saddam’s marble jacuzzi, sans water. I just imagined the shenanigans that happened in that tub with Saddam and the ladies…wow!!! 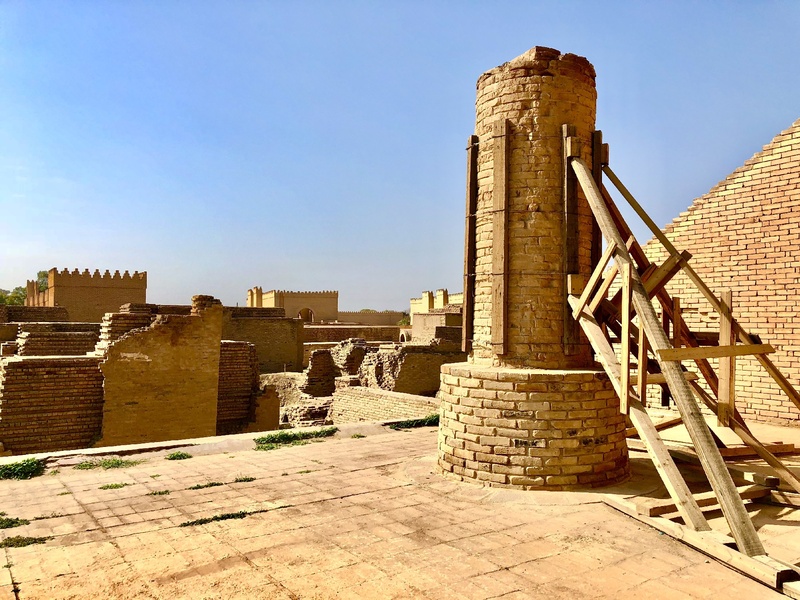 The outside balconies and courtyards had spectacular views of Babylon and the Euphrates River. There was a giant pool, drained, just below the terrace. 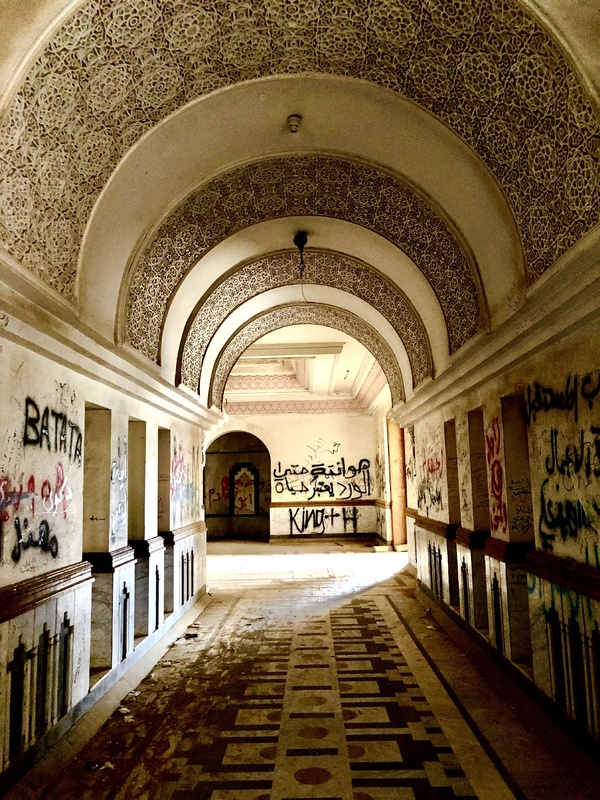 The half-lit, graffiti stained corridors of Saddam’s palace looked and felt a tad eerie. 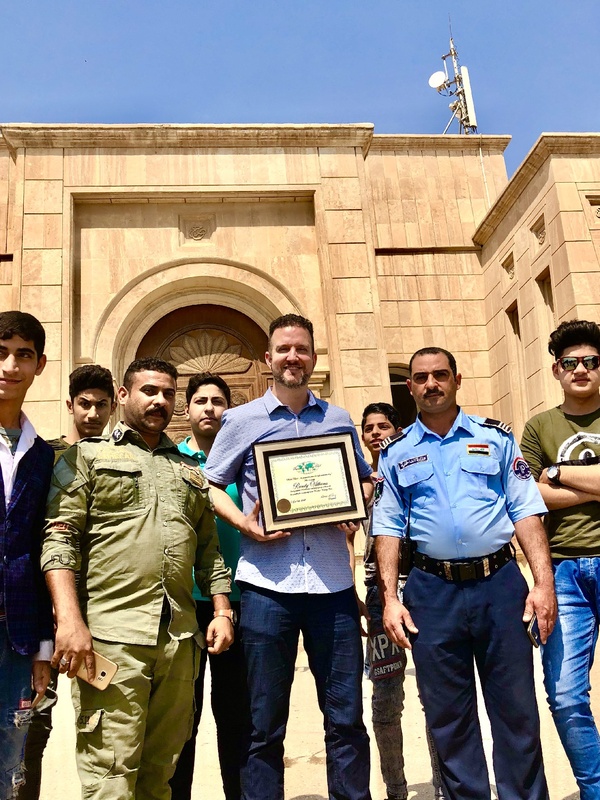 Out front, the building’s security and some curious youth posed for a selfie with me and my “100 Countries Visited” certificate awarded by The Travelers’ Century Club. 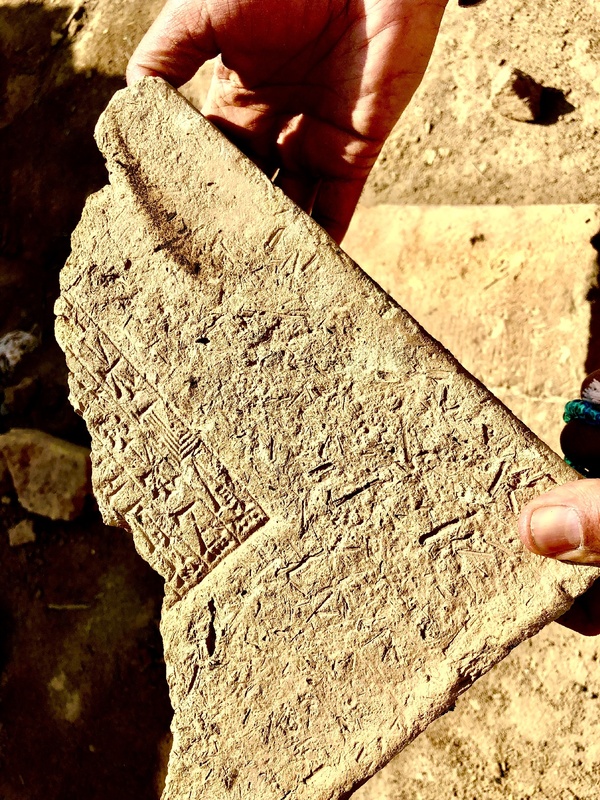 The perfect topper to a breathtaking tour of Babylon was running into a group of primary school graduates as we headed to our car. Their teal caps and gowns sparkled in the sun as their energy radiated. I asked Adam to ask their teacher if it’d be okay if we all took a selfie together. I know it’s kind of weird (and usually frowned upon) to take pictures with children you don’t know (stranger danger), but I couldn’t resist. I wasn’t sure if the teacher and/or the group of kids would be up for it, but as soon as they found out I was American, you would’ve thought they just ran in to Justin Bieber. Not only did they take a selfie with me on my phone, but soon every child was whipping out their phone, taking a selfie with me, too. It seemed they were just as excited to see me as I was to see them. The whole chance meeting was incredible, and the kids seemed to really love being able to practice their English with an American. Such wonderful little human beings. I wonder if any of them had ever had any prior interactions with Americans, or if they’d been told bad things about us. I hoped–just maybe–that our quick moment of selfies, smiles and laughs would leave a positive impression. Next, we headed west for Karbala. Another very holy city, Karbala attracts tens of millions of Shi’ite Muslims each year, rivaling Mecca as a place of pilgrimage. 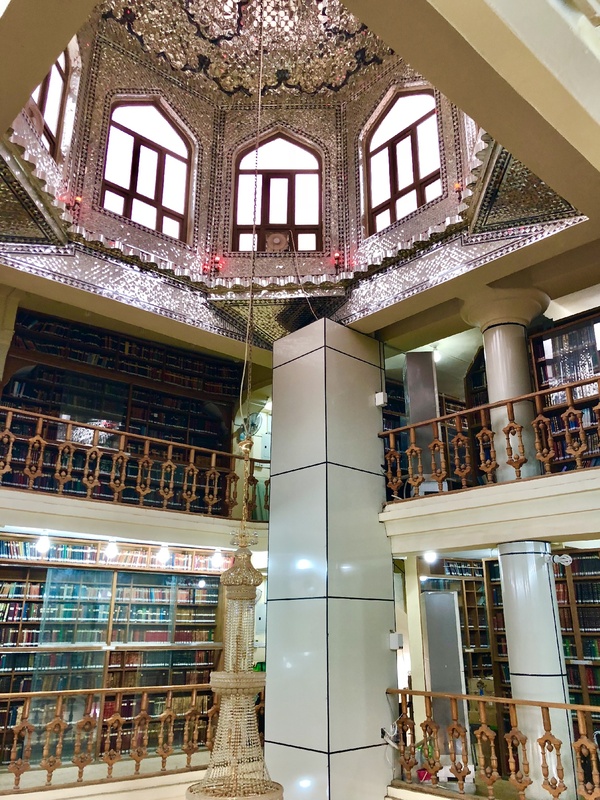 Our stop included tours inside the stunning Abbas Grand Mosque and Museum and the Imam Hussein Mosque and museum; both extremely important in the Muslim world and just absolutely gorgeous inside and out. As with yesterday’s mosque tours, there were no cameras allowed inside, so you’ll have to use your imagination. Better yet, see for yourself, as some things are best left to see in person. A busy day in Karbala. 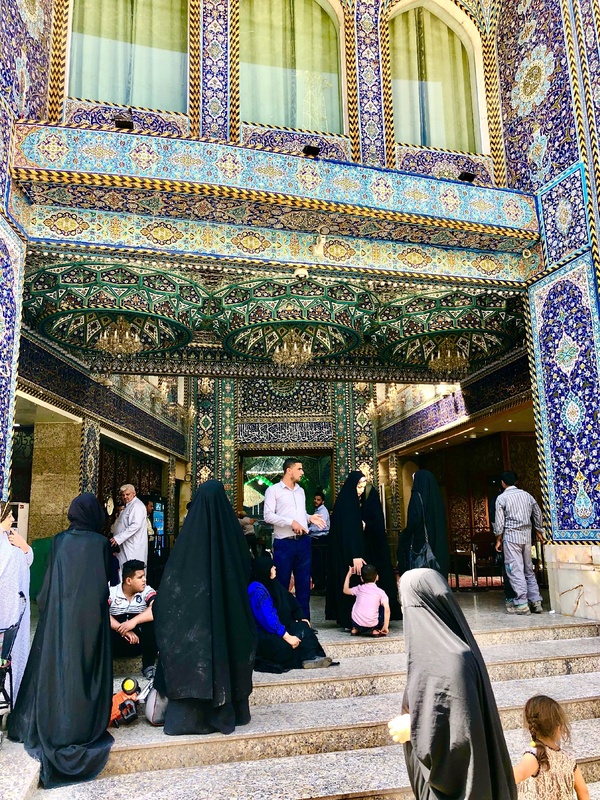 But even more than the mosques, which were certainly the grand attractions of Karbala, I once again found the most joy in simply meandering down the passages of town, peeking into stores, soaking in the sounds and the smells, and people watching. My senses were once again overloaded and invaded by the sweets vendors, juice stands, clothing stores and masses upon masses of people. Beautiful people. A couple moments on the street that I will never forget: A child who approached us with candy. 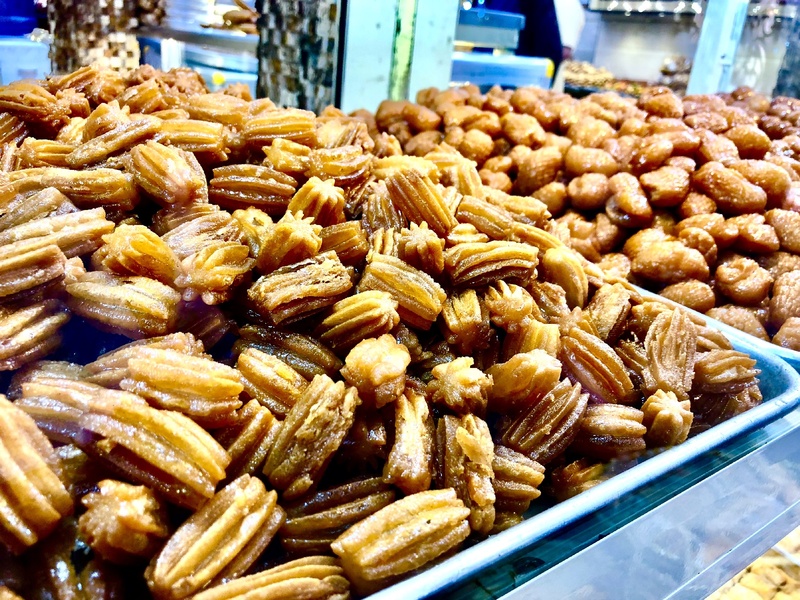 As Adam explained: when someone comes to the mosque and prays–or “wishes” for something–and that wish comes true, they must return to the same area later with candy. These pieces of hard candy are then passed out to the crowds by the “wisher.” When you receive the candy, then you now are to make your wish. And the cycle continues. Pretty neat. I made my wish. And ate the candy. Another time that same afternoon, two small girls on the street–who looked not so well off–attempted to sell me some prayer stones (turbah). These discs, made from clay, are used during daily prayers to symbolize earth. I didn’t want nor need the stones, and attempted to brush the girls off. After all, if I bought everything that was peddled to me on the street, I’d be broke, and out of room in my suitcase. But instead of insisting or harassing me, the two girls just looked up at me, saying nothing. It took about 20 seconds for their angelic smiles to completely melt my heart, and I willfully handed over some cash to buy a few packs of the stones. I didn’t get a photo of the girls, but I will never forget their smiles. It was impossible to say no, and I’m glad I didn’t. 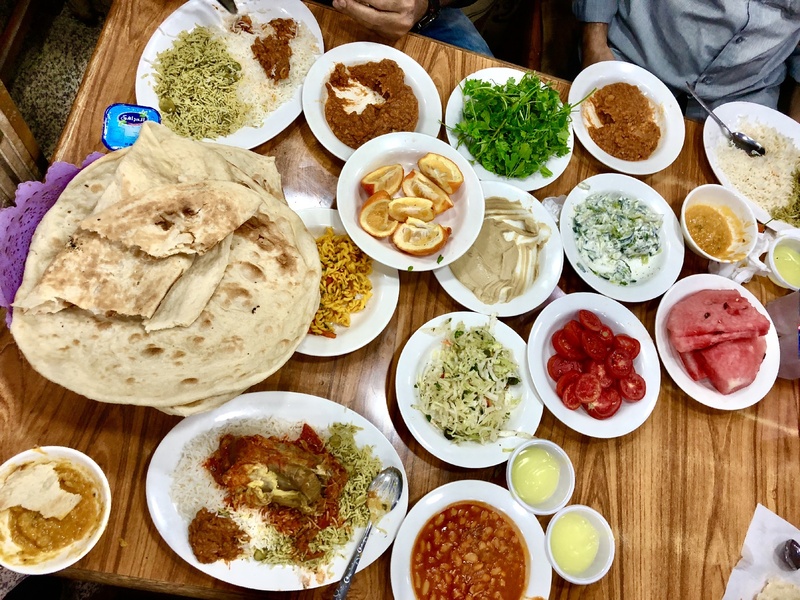 We finished our walk and mosque tours with another hearty meal that included all the fixins. I once again devoured so much food that I almost felt guilty, but I knew that I’d walked enough that day to deserve all that was on my plate. It was much needed fuel. 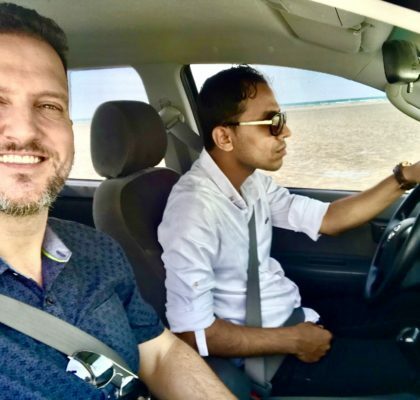 We had a nice drive back to Najaf, as the sun set, stopping at three regional checkpoints to show our “papers” to the officials. I was able to snap some photos of some really cool murals just before dark. I’d had a thrilling but exhausting two days in Iraq and I couldn’t wait to lie down. I’m so old! 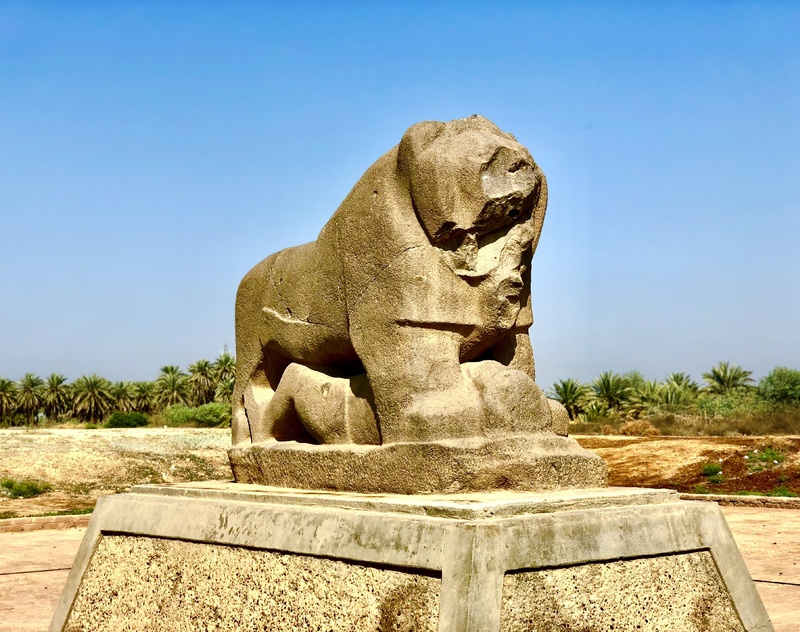 Lion of Babylon…I just saw the real one earlier that day! But we weren’t finished. Before Adam dropped me off at the hotel, he was kind enough to invite me to his house for dinner with his family. This would be another money-can’t-buy experience; an evening filled with love, laughs, some learning, and wonderful food prepared by his lovely wife and mother-in-law. His kids were precious and people I hope to not only stay in touch with, but see in person again soon. I’m not sure I’ve ever experienced so many emotions, so close together; the widest range of feelings I’ve ever felt in one 48-hour period. From nervousness, anxiousness and fear, to excitement and pure adrenaline…sheer astonishment, wonder and delight. And a whole lotta love. I feel that this wasn’t just a “fun” trip, but an important one for my soul; a physical and emotional journey that helped my heart and mind grow, exponentially. This trip was such a meaningful reminder that any one nation, and its people, aren’t simply defined by what we hear and see on the news. I’m embarrassed to say, that many years ago, after 911, I was the angry guy cheering that we were bombing Iraq. Today I feel remorse for these thoughts. 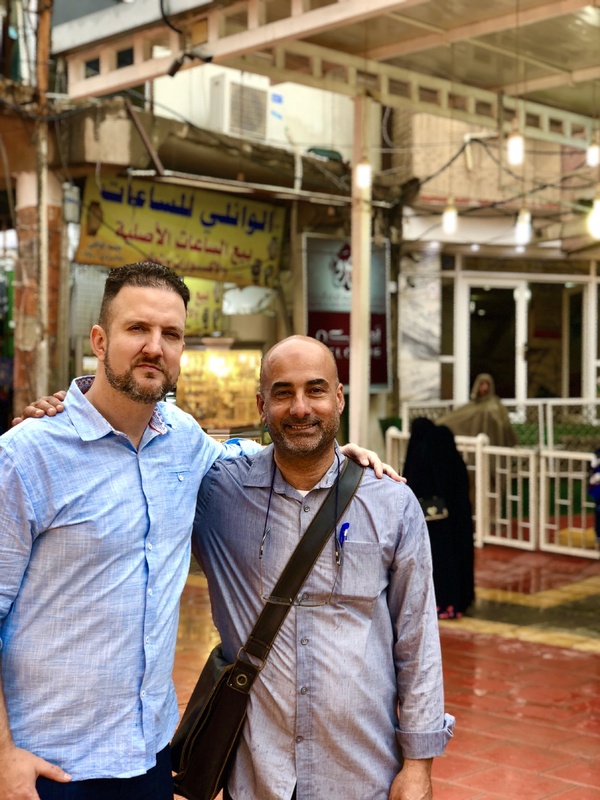 I am happy to say, that after being on the ground here and actually getting to know so many absolutely wonderful and loving Iraqis, that I’ve changed many of my views. 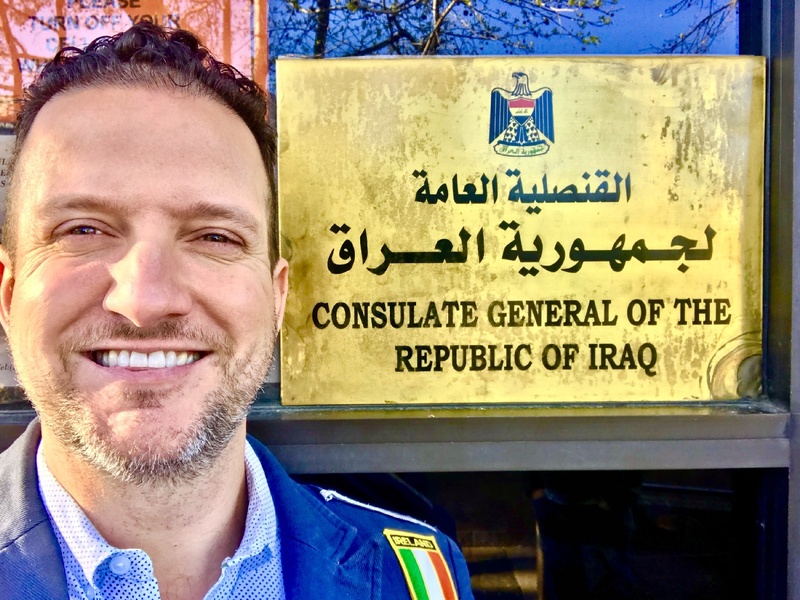 I believe that my very short time in Iraq has helped me become a more compassionate person and I only hope that more people are able to travel outside their comfort zone and see the things I have. It’s a beautiful world out there if you’ll only allow yourself to go out there and experience it. Thanks #100. A great place for #100, Randy:-). 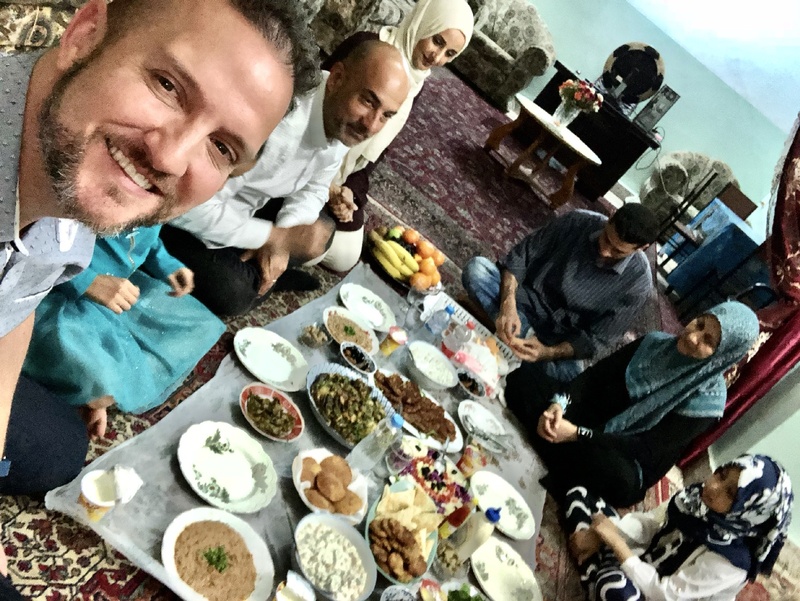 Its amazing how little animosity there is to Westerners there, given past events, and the great hospitality and genuine friendliness you experienced first hand. 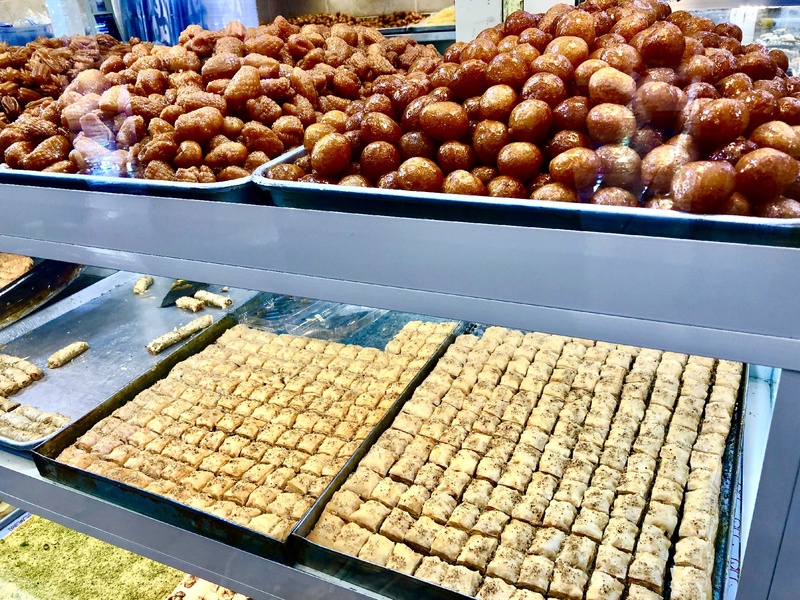 The donut holes I think are Lokma and the dessert on the big dishes is Basbousa. I hope you got to taste them too:-). I must admit that I am a die hard fan of you. I’ve been following your blog ever since you left Nauru. When I saw your blog about Iraq, I was expecting a lot of Soldiers, Guns and all those sorts of stuff. But the photos just amazing and the extreme opposite of what I expected. Anyways, wish to meet you some day in one of your travels. I’m very flattered and that’s very kind of you! Thank you so much. More to come, I appreciate you checking out my blog. hi randy, may i know how much does it cost for hiring a tour guide ? Hi Patrick! 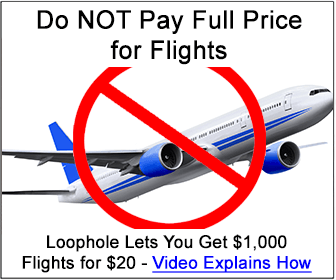 Organizing a tour to Iraq proper with less than five people is pretty cost prohibitive. It can be done–it’s just a LOT. I recommend getting a group of five or more together. Either way, reach out to Soviet Tours for availability and pricing. A much less-expensive option is to visit Kurdistan, Iraq! Much, much reasonable, price wise.